Many early photographers included an imprint of their name and studio on the cabinet cards, photographs, and postcards that they produced. The imprint not only served as a form of advertising for their services, but also provided identification information for the possessor of the photograph to obtain additional copies since most photographers maintained a collection of negatives of their photographs. The imprint on a photograph can provide valuable clues to dating when the image was taken and possibly where it was taken. From genealogical and family history perspectives, the imprint may allow an individual to connect people with places at a particular period in time. This sort of information can quickly result in a cascading discovery of other relatives living in the same area at the same period of time. Hence, an imprint can become a useful artifact into the discovery of one's genealogy and family history. An attempt has been made here to enumerate the photographers that conducted business within Porter County, Indiana, prior to 1925. 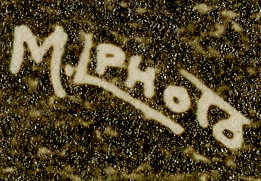 Photographers' imprints have been included when examples of them could be found. Also included, if known, is the location where the photographer conducted business, their approximate date of operation, and a brief outline of their genealogy. Note that this list is very likely to be incomplete. This blog post will be continually updated as new information is discovered concerning Porter County's early photographers. Your contributions of scanned images of photographers imprints would be greatly appreciated, as well as any information related to the photograph from which the imprint was obtained - especially if the location and date (or approximate date) of the photograph is known. Contributions can be sent to shookgenealogy@gmail.com. Ernest G. Wagner is thought to have been a involved in photography as an income-producing hobby rather than as an occupation. He and his family resided in the Town of Porter on Sherman Avenue, later renamed Wagner Road, and he was employed as a telegraph operator for a railroad company. It is believed that Atkins resided in Porter County no earlier than 1907 and no later than 1917. Wagner produced several different postcards depicting street scenes located in Chesterton and the Town of Porter. These postcards were likely sold by local retailers. Several examples of his postcards exist and they are postmarked between 1907 and 1910. Atkins imprinted his work with E. G. ATKINS and Photo by E. G. ATKINS. Ernest G. Wagner was born on November 22, 1886, at West York, Crawford County, Illinois, the son of Thomas S. Atkins and Ada Bertha (Coryell) Atkins. Ernest married Maude Murray on December 20, 1906, at Chicago, Cook County, Illinois, and to this union were born two sons, Paul and Walter. It is believed that Ernest and Maude divorced, and he would then marry Zilpha E. Foster on June 5, 1918, at Taylorsville, Christian County, Illinois. One son, Edward Francis Atkins, was born to Ernest and Zilpha. Atkins passed away on November 22, 1921, just hours prior to the birth of his son Edward, at Decatur, Macon County, Illinois. Ernest is buried in Fairlawn Cemetery in Decatur. Nelson Lafayette Ault's photographs were published as real photo postcards. The only known photographs produced by Ault were taken in 1914 at the Disease Prevention Day Parade. Ault's postcards were inscribed with AULT PHOTO. In 1909, Ault opened a photography shop located a 303 South Michigan Street in South Bend, St. Joseph County, Indiana. The 1910 Federal Census for Penn, St. Joseph County, Indiana, enumerates Nelson L. Ault as being a 26 year old photographer. A World War I draft registration card completed in 1918 shows that Ault was still working as a photographer at his shop on Michigan Street. Note that research suggests, but does not conclusively confirm, that the Ault appearing on Valparaiso postcards is Nelson Lafayette Ault. 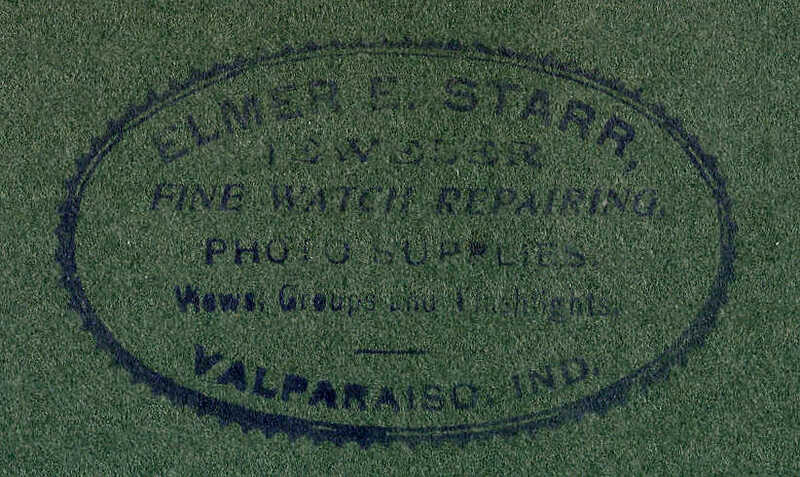 For instance, the imprint on Valparaiso postcards matches those on South Bend images that were produced by Ault. Nelson Lafayette Ault was born February 20, 1883, in Antigo, Langlade County, Wisconsin, the son of William Albert Ault and Lillie Jane (Hobart) Ault. He married Clarrissa Devine (Dilling) Ault in 1905. Ault died on June 17, 1960, in Naples, Collier County, Florida; he was interred in Riverview Cemetery in South Bend. Despite Ault's death, the Ault Camera Shop continued operation on Michigan Street till its closure in 1978. Around 1915, Cassius E. Barrett moved from Iowa to Valparaiso and established the community's first five and dime store. He would later expand his mercantile business to include items with higher prices. Prior to 1920, Barrett retired from retail trade. He was elected recorder of Porter County on the Republican ticket in 1922 and served the county in this capacity until 1932. 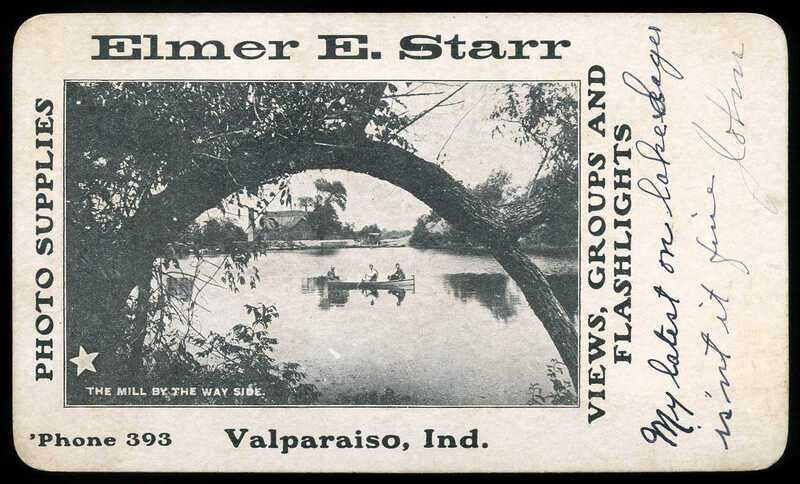 Barrett produced numerous postcard scenes focused on Flint Lake, Sager's Lake, Valparaiso, and Valparaiso University. 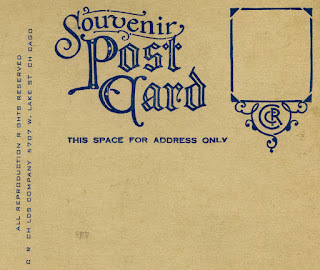 Given evidence, it is believed that Barrett was producing his postcards between 1910 and 1915; it is suspected that Barrett sold the postcards at his retail establishment. 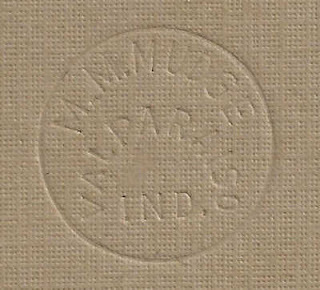 Barrett's postcards were imprinted with C. E. Barrett. Cassius E. Barrett was born at New London, Huron County, Ohio, on November 3, 1852, the son of Eliada Barrett and Wealthy (Blackman) Barrett. Cassius married Jennie B. Dille on November 17, 1908, in Valparaiso. On November 24, 1945, Cassius passed away at his home, 205 Franklin Avenue in Valparaiso, and was buried in Maplewood Cemetery on November 24. The subject matter of Charles Webster Beam's photographs and postcards were generally of community events taking place in Valparaiso, Kouts, and Hebron. Known dates for Beam photographs range from 1909 to 1918. Beam may have been an amateur photographer who sold his postcard photographs to local retailers. Beam owned and operated a book and stationery supply store on College Hill in Valparaiso; he may have also sold cameras and photography supplies at his store. Beam's work was typically imprinted with Photo by Beam, Photo BEAM, Photo Beam, Photo - C. W. Beam, or Chas. W. Beam. Charles W. Beam was born on February 8, 1882, in Kewanee, Henry County, Illinois, the son of Edgar Gene Beam and Margaret Pedersdatter (Danielson) Beam. Charles would marry Bessie Grace Jenewein. At some point between 1920 and 1930, Charles and Bessie would move from Valparaiso to Los Angeles where he would own and operate a bookstore and become the first official photographer of the Hollywood Bowl. Charles passed away on September 1, 1933, at Los Angeles, and is buried at Forest Lawn Memorial Park in Glendale, Los Angeles County, California. developing at Charles W. Beam's retail store on College Hill in Valparaiso. Reverse of postcard promoting film developing at Charles W.
Beam's Student Supply Store on College Hill in Valparaiso. Advertisement for Charle's W. Beam's Student Supply Store. Source: The Torch, July 7, 1916. Beatty's photography studio was located at 65 College Avenue and later at 20 South Locust Street in Valparaiso. Photographs were imprinted Beatty. Research suggest that Beatty's photography business operated in 1880s and into the early 1890s and was then apparently sold to Henry A. W. Brown. Research has failed to positively identify Beatty. Belling's photographs were produced into postcard images. Known dates for Belling postcards range from 1907 to 1908, with the subject matters being Sager's Lake and buildings located on the Valparaiso University campus. 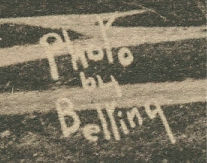 Belling's work was imprinted as Belling Photo or Photo by Belling. Research aimed at identifying Belling has not been fruitful. Given the limited dates on Belling's work, as well as the subject matter of Belling postcards, this individual may have been a student at Valparaiso University. William Seth Bentley operated a studio on Main Street [Lincolnway] directly across from the county courthouse in the late 1880s and early 1890s. His photographs were imprinted W. S. Bentley. Bentley had moved away from Valparaiso by December 1892. William Seth Bentley was born in Detroit, Wayne County, Michigan, in December 1860, the son of Seth J. Bentley and Mary (Green) Bentley. The 1880 federal census for Kankakee Township, Jasper County, Indiana, indicates that William was residing with his parents, two brothers, and three sisters, and was working as a farmer. He married Lena May Bell Hawkins on February 28, 1891, at Valparaiso. William and Lena were living in Chicago by December 1892 when their son Marion was born there. The 1900 federal census for the Burton Precinct (Vashon Island) of King County, Washington, shows Bentley's occupation as a locomotive engineer. The 1930 federal census for the Burton Precinct of King County, Washington, lists William's occupation as a poultry farmer. William appears in the 1940 federal census for the Burton Precinct of King County, Washington, as an 80 year old widow. He died on January 2, 1949, at Everett, Snohomish County, Washington, at the age of 89 years. Henry H. Bregstone operated a photography business at Danville, Vermilion County, Illinois, producing real photo postcards of locations in Missouri, Illinois, and Indiana. There are at least three known examples of Bregstone real photo postcards taken in Porter County - the Pittsburgh, Cincinnati, Chicago & St. Louis Railroad depot in Hebron, the Christian Church in Hebron, and the bridge spanning the Kankakee River south of Hebron. Postcard images produced by Henry H. Bregstone were imprinted BREGSTONE and H. H. Bregstone. Bregstone graduated from the Chicago College of Law in 1898 and practiced as an attorney for a few years in Cass County, Indiana, before transitioning into the photography business at some point in time between 1900 and 1910. Bregstone had siblings residing at Chicago and Michigan City, LaPorte County, Indiana, so he was likely to be somewhat familiar with Porter County. Bregstone is most noted for the real photo postcards that he produced of professional baseball players during the early 1900s; these postcards are very rare and highly collectible, and thus quite valuable. Henry H. Bregstone was born in Poland on January 9, 1865, the son of Selig Bregstone and Hannah Rebecca (Rivka) Bregstone. 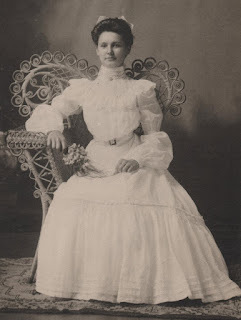 On December 24, 1901, Henry married Katherine L. Stout in Bourbon County, Kansas. Bregstone died in Danville on May 24, 1940, and was buried June 5 in the Spring Hill Cemetery in that community. Herbert B. Brooks was the son of Margaret A. (Larkin) Brooks, and together they published numerous real photo postcards of locations throughout the greater Chicago area. Their real photo postcards typically used the written imprint Brooks Photo. The Brooks would establish a partnership with Dalibor Ralph Chapek for a period of time and imprinted these postcard images as Brooks Chapek Photo. The area in and around the Indiana Dunes and Waverly Beach was the predominant subject matter for Brooks and Brooks Chapek postcards taken in Porter County. Herbert B. Brooks is believed to started his own commercial real photo postcard business for a short period of time. He would imprint his real photo postcards with Brooks and H. B. Brooks Photograph Post Cards. He apparently formed a business partnership with his mother after 1920. Herbert appears in the 1920 federal census of Ward 23 in Chicago, along with his wife Judith and son Burton. Herbert is enumerated as a 37 year old and his occupation is listed as "Manager" in the "Com. Photography" industry. Margaret and her son Herbert appear in the 1930 federal census of Precinct 53 in Chicago. Margaret is listed as a 69 year old widow and her occupation is listed as "Comm. Photographer" in the "Post Card" industry. Herbert, who is residing with Margaret, is listed as a 47 year old with his occupation noted as "none." Herbert B. Brooks was born June 11, 1882, in Illinois, the son of Howard F. Brooks and Margaret A. (Larkin) Brooks. Herbert would marry Judith Samuelson, who preceded him in death. Herbert passed away on February 26, 1936, at 1340 Granville Avenue in Chicago and was buried on February 29 at Mount Carmel Cemetery in Hillside, Cook County, Illinois. Margaret A. (Larkin) Brooks was the mother of Herbert B. Brooks, and together they published a large number real photo postcards of locations throughout the greater Chicago area. Their real photo postcards used the imprint Brooks Photo. The Brooks would establish a partnership with Dalibor Ralph Chapek for a period of time and imprinted these postcard images as Brooks Chapek Photo. The area in and around the Indiana Dunes and Waverly Beach was the predominant subject matter for Brooks and Brooks Chapek postcards of Porter County. Margaret is believed to have entered the commercial postcard business with her son Herbert at some point after 1920. Margaret appears in the 1920 federal census of Ward 14 in Chicago, along with her brothers James and Edward Larkin, both brothers being listed as police officers in that census. Margaret is enumerated in the 1920 census as a 60 year old widow and her occupation is listed as "Housekeeper." Margaret and her son Herbert appear in the 1930 federal census of Precinct 53 in Chicago. Margaret is listed as a 69 year old widow and her occupation is listed as "Comm. Photographer" in the "Post Card" industry. Herbert, who is residing with Margaret, is listed as a 47 year old with his occupation noted as "none." Margaret A. (Larkin) Brooks was born December 9, 1860, at Buck Mountain, Columbia County, Pennsylvania, the daughter of Patrick Larkin and Margaret (Kiernan) Larkin. She married Howard F. Brooks who passed away in July 1916. Margaret died on February 3, 1938, in Chicago and was buried at Mount Carmel Cemetery in Hillside, Cook County, Illinois. Harriet E. (McCauley) Brown produced real photo postcards in partnership with an individual named Brooks. Research focused on identifying the Brooks in this partnership has been inconclusive. The company address appears on some of their postcards as 2019 Lane Court in Chicago. Brooks & Brown produced real photo postcards of locations in Valparaiso, predominantly of sites in and around Valparaiso University, between 1910 and 1920. Their work was imprinted with either a hand written BB on the front of the image or printed on the reverse with BROOKS & BROWN. 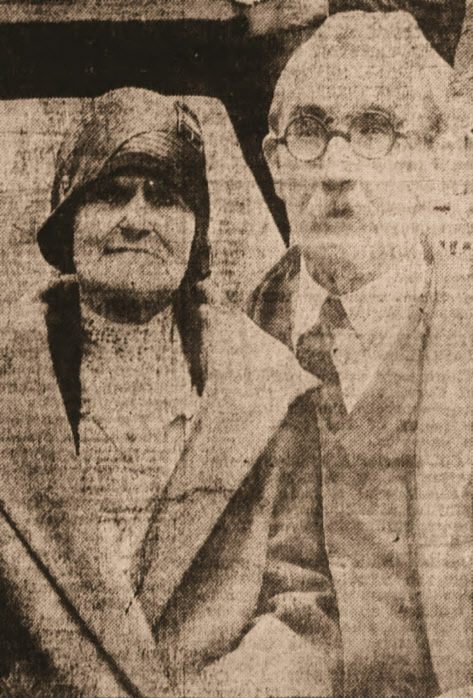 -- Harriet E wid Frederick A h 2019 Lane ct.
An individual by the name of Brown, presumably Harriet E. Brown, placed a classified advertisement for a three room rental suite at 2019 Lane Court in the March 26, 1916, issue of the The Chicago Sunday Tribune. It is possible that the Brooks in this partnership was either Herbert B. Brooks or Margaret A. (Larkin) Brooks. Harriet E. (McCauley) Brown was born in July 1849 in New York, the daughter of Charles and Margaret McCauley. She was married to Frederick A. Brown. An 1884 Cook County, Illinois, birth record for their daughter Maud indicates that Harriet's maiden name was McCauley. The 1900 federal census records show that Frederick and Harriet were residing in Paw Paw, Van Buren County, Michigan, where 60 year old Frederick's occupation is listed as "Grocer." No occupation is provided for Harriet in this census record. The 1910 federal census record for Casco Township, Allegan County, Michigan, shows that Harriet E. Brown was living with her daughter, Ethel M. (Brown) Cogdall. Harriet is enumerated as a 61 year old widow, born in New York, with no listed occupation. Harriet is listed in the 1920 federal census in Ward 25 of Chicago; she is living at 1314 Waveland Avenue (four blocks west of Wrigley Field) with her son Frederick's family as a 71 year old widow with no listed occupation. Son Frederick is a listed as a clerk at Marshall Field. Research attempting to locate Harriet after her enumeration in the 1920 federal census has been fruitless. Brown, Heinrich A. W. "Henry"
Henry A. W. Brown marked his photographs as Brown & Company. Brown operated a photography gallery located on College Hill in Valparaiso, and his business is listed in the Valparaiso city directories of 1893 and 1902 as being located at 20 South Locust Street. Research suggests that Brown purchased the photography business of Beatty around 1892 or 1893. Brown likely remained in business till 1897 when he and Valparaiso resident Theodore Hansen, son of Liberty Township farmer John N. Hansen, were each convicted on November 28, 1897, in federal court of counterfeiting silver certificates; Brown and Hanson were consequently sentenced to five years imprisonment at Columbus, Ohio. Brown was described as "a nervous little German with mutton chop whiskers just turning gray, and a face suggesting the ideal anarchist" and "a photographer of more than ordinary ability." Brown made photographs of one, two, and five dollar silver certificates. He used the negatives to produce plates for printing money. Thomas B. Carter and Thomas J. Porter, agents with the United State Secret Service, learned that counterfeit bills were circulating in the Indiana counties of Lake, LaPorte, and Porter and had detectives dispatched to the region to identify the producer of the fake money. The Secret Service raided Brown's College Hill studio and discovered a nearly completed counterfeit ten dollar silver certificate. At the Hanson farm, situated just south of Mink Lake in Liberty Township, investigators found other plates, a small press, paper, and inks used to produce counterfeit bills in a small outhouse. Henry A. W. Brown was born June 14, 1844, in Germany. He married Anna Cole. Brown died at his Locust Street property in Valparaiso on June 26, 1908, and interred in nearby Maplewood Cemetery. A. G. Cameron specialized in portrait photographs in Valparaiso during the 1890s and he resided at 18 West Jefferson Street. Little is known of this photographer. Dalibor Ralph Chapek, of Chicago, produced real photo postcards with Margaret Brooks imprinting them as Brooks Chapek Photo. The Indiana Dunes and Waverly Beach were the most common photographs produced by Brooks & Chapek. Dalibor Ralph Chapek was born December 18, 1886, in Wisconsin, the son of Frank P. Chapek Theresia (Matoush) Chapek, and passed away in July 26, 1966, at Fort Myers, Lee County, Florida, and was buried in Fort Myers Cemetery on July 28. Charles R. Childs was one of the most prominent photographers and postcard producers in the Chicago area, commercially active in the early 1900s through the 1950s. The majority of Childs' postcards provide historical documentation of life in communities located in Illinois, Indiana, Michigan, and Wisconsin. Childs would send his photographers out on the interurbans from his Chicago studio located at 5707 Lake Street to surrounding communities with instructions to capture saleable views. The postcard views were then mass produced and wholesaled to local merchants in the outlaying communities for retail sale. Nearly all of Childs' photographs and postcards are marked as C. R. Childs or C. R. Childs Company. One of Childs' most impressive works was his "Duneland Camera Study" postcard series, which captured the natural scenery of the Indiana Dunes region. In Porter County, Childs captured scenes of the Indiana Dunes, Porter, Chesterton, Valparaiso, Hebron, Kouts, and Flint Lake. Given the breadth of coverage, the longevity of his business, and the fact that his company photographed both large and small communities, Childs was one of the few photographers to fully capture life in the Chicagoland area from 1900 to 1950. Charles Russell Childs was born March 28, 1875, at Chicago, the son of John D. and Sophronia Olivia (Pinneo) Childs. He passed away at Chicago on January 15, 1960, and was buried in Mount Olivet Cemetery in Chicago. Elmer E. Coddington specialized in portrait photographs. He resided at 110 East Jefferson Street, Valparaiso, and was active in the photography business during the 1890s before he moved to LaPorte, LaPorte County, Indiana, in 1897. At LaPorte, Elmer would own and operate a hardware store for 35 years. Elmer E. Coddington was born January 6, 1862, near Abingdon, Knox County, Illinois, the son of John Coddington. He married Charlena Parkinson on March 15, 1883, at Hebron, Porter County, Indiana. Elmer passed away on September 27, 1938, at Fairview Hospital in LaPorte, and was interred at Door Village Cemetery in LaPorte County on September 29. 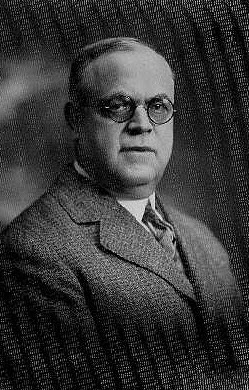 Lloyd Lewis Cook established the L. L. Cook Company at Milwaukee, Milwaukee County, Wisconsin, in 1921. The company would soon become one of the largest publishers of postcards in the United States. The vast majority of L. L. Cook Company's postcards were real photo postcards that were imprinted on the reverse with The L. L. Cook Co., Milwaukee. 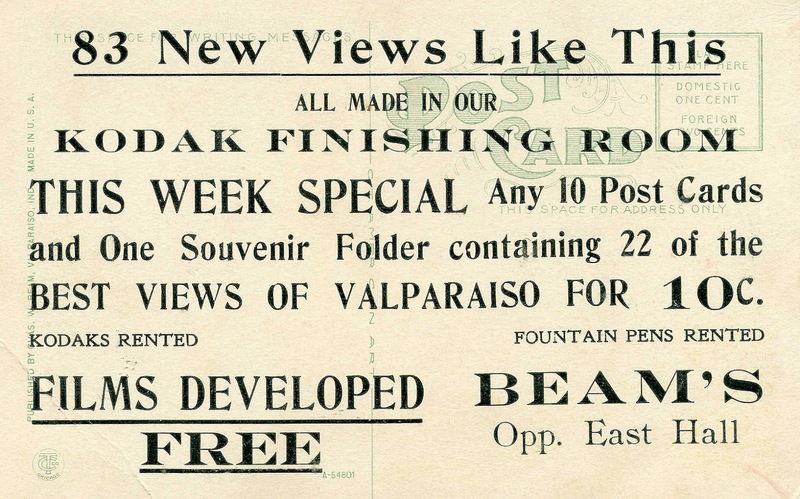 The company produced and sold numerous real photo postcards of Valparaiso locations, especially during the 1940s. In 1956, the company would purchase a major competitor, the E. C. Kropp Company, and continue publishing real photo postcards into the 1960s. Lloyd Lewis Cook was born at Lake Mills, Jefferson County, Wisconsin, on June 24, 1887, the son of James Lewis Cook and Marguerite Katherine (Krippner) Cook. He married Jessie Edna Smith in 1912. Lloyd died on May 17, 1972, in Milwaukee and was buried at Rock Lake Cemetery in Lake Mills. Thomas A. Crose was a photographer of Lake County scenes who typically hand marked his photographs and postcards as Crose, Crose Photo Co., or Photo by Crose. Some of the highest quality photographs of the industrial development of northern Lake County were taken by Crose. Crose was also one of the few photographers in Northwest Indiana that produced panoramic photographs. Crose also published photographs and postcards of Porter County locations, especially of the Kankakee River and Hebron areas. Thomas A. Crose was born October 5, 1865, in or near Brookston, White County, Indiana, the son of Solomon and Tacy Jane (Smith) Crose. Thomas married Elizabeth Jane Cunningham on April 16, 1889, in Carroll County, Indiana. Thomas passed away on February 17, 1931, in White County, Indiana. Crose Photo Company advertisement in city directory. Joseph Decker was a prolific publisher in Valparaiso during the early 1900s and was commonly referred to by county residents as "Little Joe Decker." 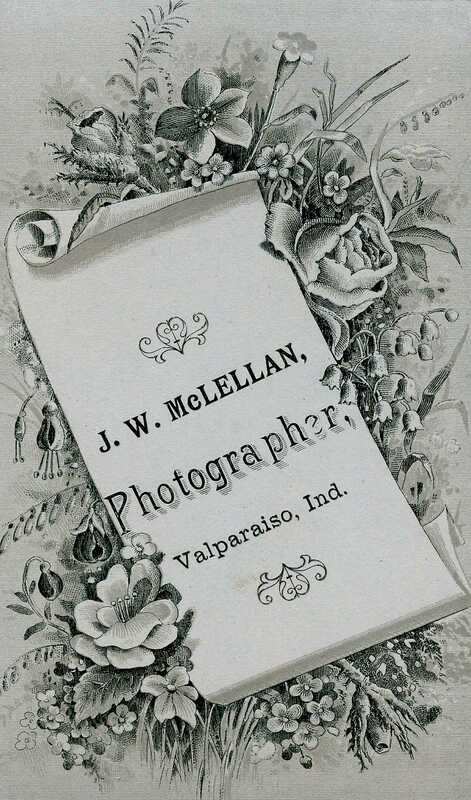 Decker published city directories, photographs, and photograph books that promoted the community, educational opportunities, and businesses of Valparaiso. Decker's occupation was primarily in advertising, but he made prolific use of local photographs in his promotional materials. Joseph Decker was born in 1854 in Germany. He migrated to Valparaiso from Germany in 1870 to work in Joseph Steinfield's retail store in the Academy of Music Block across from the county courthouse; Steinfield was Decker's uncle. Decker died at Valparaiso's Hotel Lembke at 4:30 pm on June 19, 1929. He was interred at Graceland Cemetery on June 23. 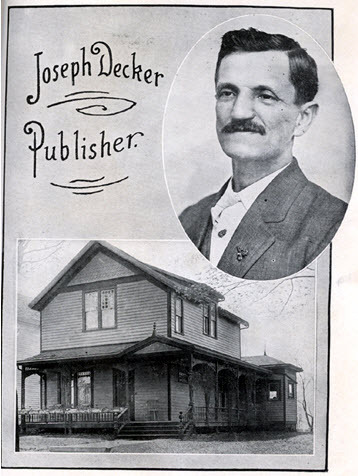 Photograph of Joseph Decker and his home, 1911. Source: Joseph Decker's Souvenir Book of Valparaiso. 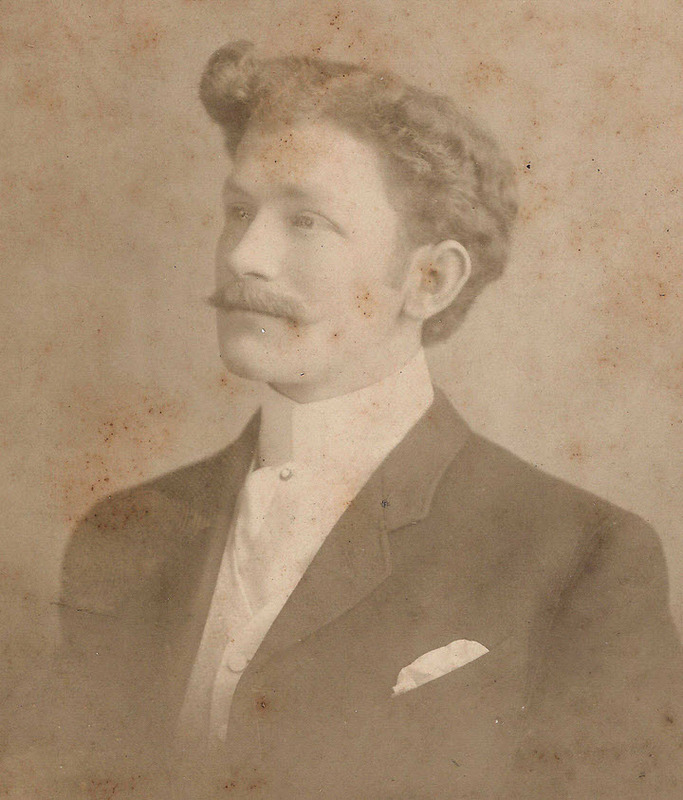 Wilfrid J. Dorward operated a studio in Valparaiso at some time between 1903 and 1905. The exact location of Dorward's studio is unknown. One of Dorward's photographs has been positively dated as 1904. Dorward's work was imprinted with Dorward. 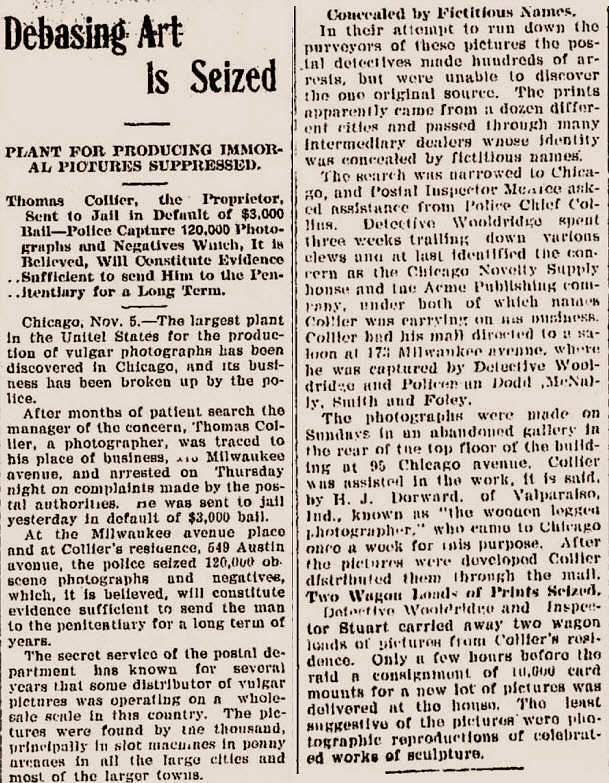 A news item published in the November 4, 1905, issue of The Chicago Daily Tribune concerns a police raid on "the largest plant in the United States for the production of vulgar photographs" located at 173 Milwaukee Avenue in Chicago and operated by Thomas Collier. More than "120,000 obscene photographs and negatives" were seized in the raid. 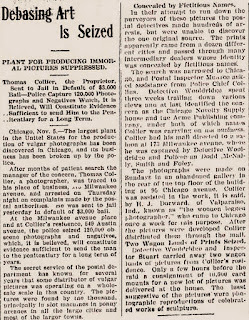 Photographs were allegedly produced on Sundays at an abandoned gallery on the top floor of the building located at 95 Chicago Avenue in Chicago, with Collier being assisted by H. J. Dorward [should read W. J. Dorward] of Valparaiso, who was "known as the wooden legged photographer." Dorward would apparently travel to Chicago once a week to assist in shooting photographs for Collier. 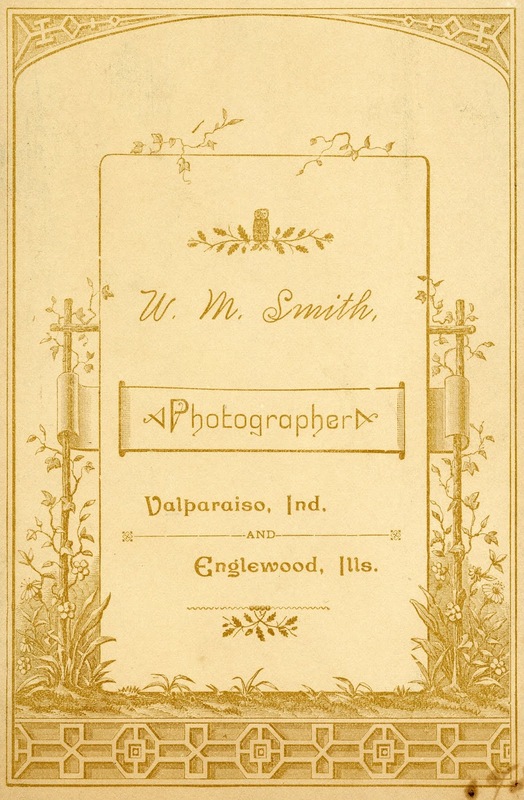 It is suspected that Dorward exited the photography business in Valparaiso soon after the Chicago raid. Wilfrid Dorward can be found in a 1903 directory for Chicago. He is listed as "Dorward, Wilfred J photog 95 Chicago av." Dorward is also listed in the same directory under Photo Engravers in the business directory section, also located at 95 Chicago Avenue. This address is identical to the one in which the police raid took place. Records from the 1900 and 1910 federal census show that Wilfrid was residing at Caledonia Township, Columbia County, Wisconsin In the 1900 census his occupation is listed as "Artist," while he is listed as a "Photographer" in the 1910 census. By 1920, Wilfrid Dorward was residing in Tacoma, Pierce County, Washington. The 1920 federal census records show that the 61 year old Dorward was living in Ward 5 of Tacoma with his 40 year old wife, Pauline. 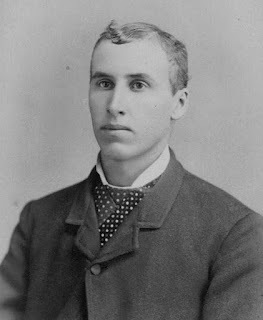 Wilfrid J. Dorward was born March 14, 1858, in Saint Francis, Milwaukee County, Wisconsin, the son of Bernard Isaac Durward and Theresa (Hillyard) Durward. At some point in time, Wilfrid would change the spelling of his name to Dorward. Wilfrid married Helga Pauline Viland. Dorward passed away on June 11, 1927, at Tacoma, and was buried at Durward Family Cemetery in Durwards Glen, Columbia County, Wisconsin. the column incorrectly provides the initials H. J. Source: Alton Evening Telegraph, November 5, 1905. Portrait of Wilfrid J. Dorward. Source: Find A Grave, Memorial No. 7731836. Benjamin Franklin Eikenberry operated the Star Studio on College Hill located on South Union Street, across the street from Commercial Hall. Eikenberry operated this studio as early as 1889 in partnership with Joseph Marion Harkless; by 1890, the studio partnership with Eikenberry had apparently dissolved as only Harkless appears on photograph imprints. No examples of photographs solely containing Eikenberry's imprint are known to exist. Eikenberry's photographs were imprinted as HARKLESS & EIKENBERRY. Benjamin Franklin Eikenberry appears in the 1890 and 1893 city directories for Valparaiso as B. F. Eikenberry and is listed as residing at 129 South Locust Street. According to a death notice, Eikenberry was a graduate of Valparaiso University and the Hahnemann Medical College in Chicago. He practiced medicine at Peru, Miami County, Indiana, for approximately 48 years. Benjamin Franklin Eikenberry was born October 27, 1869, in Miami County, Indiana, the son of John B. Eikenberry and Nancy (Miller) Eikenberry. He married Effie Ellen Wilson in Cass County, Indiana, on September 20, 1899. Eikenberry passed away on October 23, 1943, at Peru as a result of prostate cancer and was buried in Mount Hope Cemetery in that community. Portrait of Dr. Benjamin Franklin Eikenberry, MD. Source: Find A Grave, Memorial No. 25174795. Harry J. 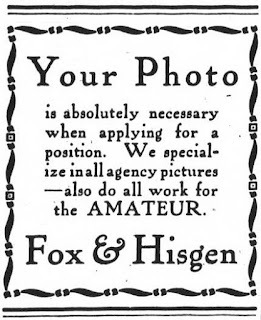 Fox was one of the most prolific early photographers of Porter County. A graduate of the School of Photography located in Effingham, Effingham County, Illinois, he specialized in portrait photography, though he also took photographs of community events and locations of special interest. Fox opened his photography studio at 455 College Avenue in 1905, the same year he arrived in Valparaiso. Fox's photographs were typically imprinted with The Fox Studios. Fox retired from the photography business in 1958, after operating from the same location for 53 years. During the mid 1910s, Hisgen operated The Studio in Valparaiso in partnership with John Walter Hisgen. Harry J. Fox was born in Lebanon, Lebanon County, Pennsylvania, on April 27, 1882, the son of John and Anna (Faber) Fox. Harry died on May 17, 1963, at Porter Memorial Hospital in Valparaiso. He is interred at Graceland Memorial Park in Valparaiso. 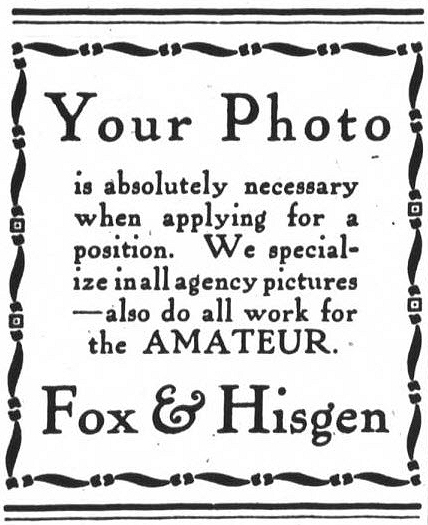 Advertisement for Fox & Hisgen. A short notice appears under Thelma community news in the August 30, 1901, issue of The Chesterton Tribune stating that "John Garrison announces that he will take pictures three days of each week in the old Friday home." No examples of Garrison's work has been identified. Note that Thelma was an alternative name given to Suman in Porter County's Jackson Township. The "old Friday home" was located in the southwest quarter of the northwest quarter of Section 28 in Jackson Township, slightly west of Suman. John Garrison is shown to own the property in the 1906 plat map of Jackson Township. John T. Garrison was born in the state of New York on February 16, 1859, the son of John V. Garrison and Ester G. (Fox) Garrison. He died on March 30, 1937, at the Christian Hospital in Valparaiso. John is interred at Dillingham Cemetery in Porter County's Liberty Township. August Frederick Haase owned and operated a photography studio in the Frederick Building at Hobart, Lake County, Indiana, from about 1906 to October 1913. Haase would sell his Hobart photography studio to J. J. Naumann in October 1913 due to poor eyesight and took up employment as an assistant engineer in the operation of gas engines at a Gary steel mill. A World War I draft registration card completed for Haase on September 11, 1918, indicates that he was employed by the Illinois Steel company in Gary and residing at Miller. The 1922 city directory for Gary lists Haase's occupation as electrician. While most of Haase's photographs were of sites located in Lake County, there are a few real photo postcard images of Woodville and Wheeler believed to have been created by him. Haase also formed a partnership with Adelbert Henry Reading from about 1902 to 1906. They would imprint their postcards with Reading & Haase Pub. 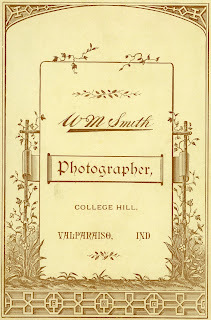 It is believed that the Reading-Haase partnership was short-lived, with Reading later firmly establishing himself as a photographer in Valparaiso. August Frederick Haase was born March 1, 1880, in Hobart, Lake County, Indiana. On March 2, 1904, in Lake County, Indiana, he united in marriage with Anna Mae Myers. The 1930 Federal Census reveals that August and his wife were living at 6721 Prairie Avenue in Chicago where August was employed as an electrician. The 1940 Federal Census places Frederick and his wife at 538 East 74th Street in Chicago; August's occupation is listed as a machinist for electrical construction. In February 1968, Haase passed away and his funeral took place on February 28 followed by his interment at Cedar Park Cemetery in Calumet Park, Cook County, Illinois. 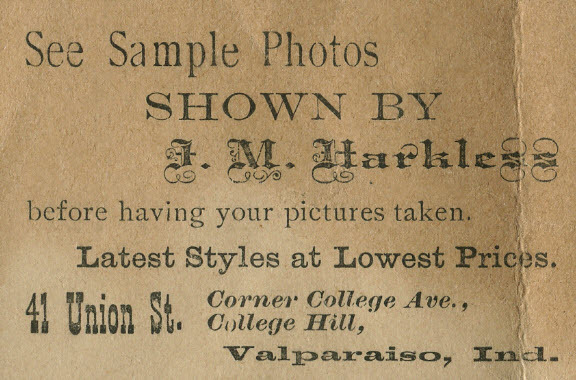 A Valparaiso photographer, Joseph Marion Harkless operated the Star Studio on College Hill at 41 South Union Street, across the street from Commercial Hall; the studio operated in partnership with an individual named Eikenberry. By 1889, however, Harkless' partnership with Eikenberry had apparently dissolved as only Harkless appears on photograph imprints. 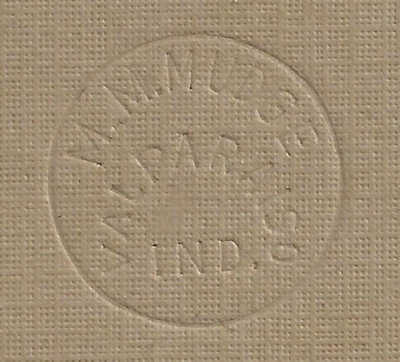 Harkless typically marked his photographs with imprints of HARKLESS & EIKENBERRY and J. M. Harkless. Some Harkless photographs include the misspelled surname of Harkles (only one "s"). Harkless also had a photography studio in Chesterton during the 1890s and early 1900s. Harkless' Chesterton studio, located just north of the Lake Shore & Michigan Southern Railway tracks at 748 Valparaiso Street (present day Calumet Road), was still in operation as late as June 1903. Gustave Lawson may have purchased his business operation directly from Harkless. On June 21, 1903, Harkless opened a studio in Porter, while maintaining the operation of his Chesterton studio. Harkless' Porter studio may have been the former studio of Rudolph H. Keagy. Few Harkless photographs exist with a Chesterton imprint; no Harkless photographs have been found with a Porter imprint. Joseph Marion Harkless was born June 4, 1867, at Monroeville, Adams County, Indiana, the son of William Harkless and Barbara Ann (Bradley) Harkless. He married Emma Gaby at Albion, Noble County, Indiana. He would pass away around 3:00 pm on July 22, 1909, in the Calumet River at East Chicago, Lake County, Indiana, due to accidental drowning. Joseph's children reportedly attempted to save him, but were not successful in their efforts. He was buried on July 25, 1907, at Rose Hill Cemetery in Albion. The 1910 federal census for Center Township, Porter County, Indiana, enumerates Lynn Harris as being a photographer with his own studio. Harris is listed as a 45 year old divorced male, born in Kansas, and residing at 108 Lincoln Avenue as a "roomer." No examples of Harris' work in Valparaiso have been found. Prior to arriving in Valparaiso, Harris was operating a photography business at Council Grove, Morris County, Kansas. He may have departed Council Grove to study at Valparaiso University or Adelbert H. Reading's Valparaiso School of Photography. Newspaper records indicate that Harris was a partner in the photography business of Harris & Garrison in 1886, which was located in Parson, Labette County, Kansas. Calvin Lynn Harris was married to Elizabeth S. Martin on February 18, 1886, in Labette County, Kansas. Clarence Hudson Hathaway is believed to have operated a photography studio in Hebron in the very late 1890s and early 1900s. He advertised in the Porter County directory published by Bumstead in 1905. His advertisement reads "High Art Portrait Developing and Finishing for Amateurs. View works of all kinds. Photo supplies, Picture framing, Enlarging pictures and Button jewelry a specialty. Also make a specialty of children's pictures." 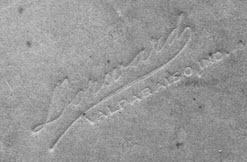 Hathaway marked his photographs with the imprint of C. H. HATHAWAY. Clarence Hudson Hathaway was born December 10, 1874, in Pulaski County, Indiana, the son of John C. Hathaway and Margaret (Conner) Hathaway. He married Etta May Reed on August 3, 1902, in Porter County. The 1910 federal census for Boone Township, Porter County, Indiana, suggests that Clarence had by then exited the photography business since his occupation is listed as "Painter" in the "House Painting" industry. Records from 1920 federal census reveal that Clarence and Etta were residing at Grayling, Crawford County, Michigan, where Clarence was employed as a "Car Inspector" in the "Railroad" industry. Clarence and Etta were still living in Grayling in 1930, but Clarence's occupation had reverted back to "Painter." Clarence died on February 4, 1949, at Cheboygan, Cheboygan County, Michigan, and was buried at Pine Hill Cemetery in Cheboygan. Allen Ellsworth Hayes is believed to have been engaged in the photography business in Valparaiso for a very brief period during the late 1890s. His business operated under the name of Imperial Art Studio and was on the second floor of the building located at the northeast corner of Main Street [Lincolnway] and Lafayette Street. Hayes' photographs were typically imprinted with A. E. Hayes and Imperial Art Studio. Allen Ellsworth Hayes was born on March 10, 1878, in Jasper County, Indiana, the son of William L. Hayes and Louisa (Goff) Hayes. Allen was living with his parents in Hebron, Porter County, Indiana, according to 1880 federal census records. On December 15, 1902, at Elk River, Sherburne County, Minnesota, Allen married Etta Louisa Whitcomb, whom he divorced prior to 1925. He would then marry Edith May Williams. Allen would remain in Minnesota for the remainder of his life where he was was a furrier. On July 8, 1968, Allen passed away at Lake Bronson, Kittson County, Minnesota, and he was interred at Lakeview Cemetery at Blackduck, Beltrami County, Minnesota. Warren Henry Hayward was a very early photographer located in Valparaiso. 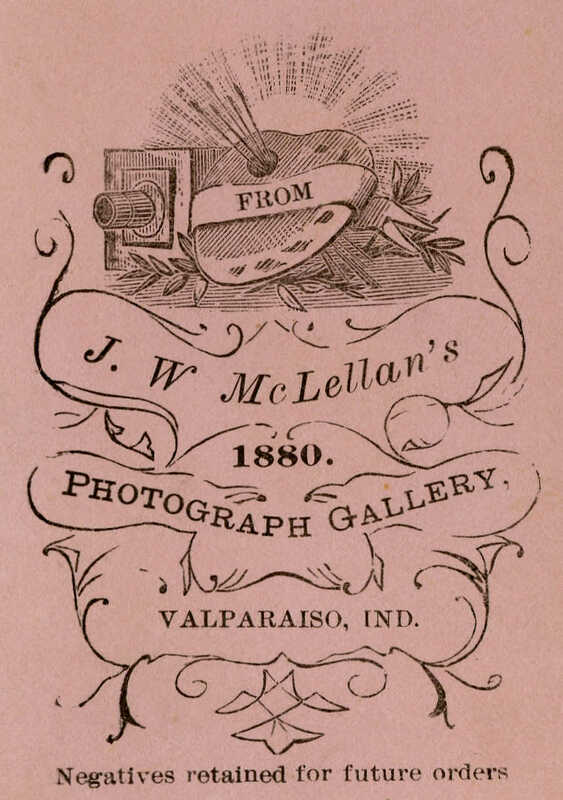 Hayward sold his Valparaiso photography business to John W. McLellan in December 1873. Hayward would remain in the photography business for the remainder of his life, operating a studio at Crown Point, Lake County, Indiana, for many years. Warren Henry Hayward was born June 25,1852 in Indiana, the son of Henry Hayward and Martha (Cronkright) Hayward. Warren would marry Jessie Bliss in Lake County, Indiana, on May 10, 1876. He would pass away at the Wesleyan Hospital in Chicago on July 26, 1917, soon after an operation to remove gall stones, and was interred on July 29 at Maplewood Cemetery in Crown Point, Lake County, Indiana. Joseph Hammond "Joe" Heward was a partner of the P. & H. Drug Store in Chesterton with Glen Lacy Phillips. This drug store produced a series of real photo postcards in February 1921 of the New York Central and Michigan Central train wreck in Porter, Indiana. These real photo postcards, which were taken by Phillips, were imprinted with P. & H. DRUG STORE. The drug store also produced a series of postcards taken at Waverly Beach along Lake Michigan. In 1929, P. & H. Drug Store was dissolved and Heward would then open his own independent drug store in Chesterton called Heward's Drug Store. Joseph Hammond Hayward was born at Grass Creek, Fulton County, Indiana, on June 28, 1894, the son of Wilson Heward and Aley (Hammond) Heward. He graduated from the University of Illinois with the degree of pharmaceutical chemist in 1917. He married Mary Antoinette Moore on March 8, 1921, in Tippecanoe County, Indiana. Joseph died on May 4, 1968, at Porter Memorial Hospital in Valparaiso, Porter County, Indiana, and was buried at Chesterton Cemetery on May 7. 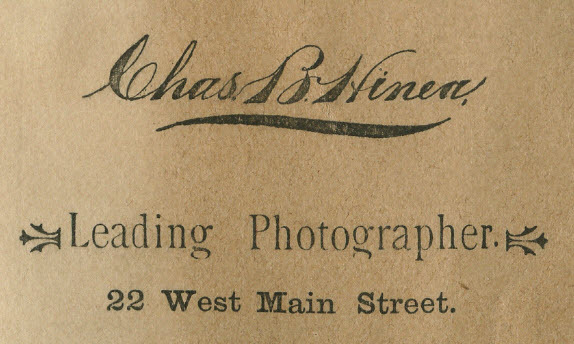 Charles B. Hinea operated a photography business at Valparaiso in partnership with Bernhardt Schuldt; their business was located at 17 East Main Street [Lincolnway]. The business was in operation in from the early 1890s to about 1901. Charles' obituary indicates that he moved to Lafayette, Tippecanoe County, Indiana, in 1898, where he opened a studio, which was where he worked for the remainder of his life. Photographs from this partnership were imprinted as Hinea and Schuldt and Hinea & Schuldt. 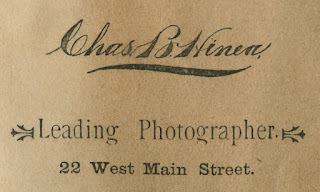 Contemporary advertising from 1893 suggests that Hinea also operated independently of Schuldt, having a studio located at 22 West Main Street in Valparaiso. Research has yet to conclusively determine whether Hinea's independent business existed before or after his partnership with Bernhardt Schuldt; evidence, however, hints that Hinea's independent business existed before the partnership. Charles B. Hinea was born at Frederick, Frederick County, Maryland, on August 14, 1871, the son of Addison and Amanda (Routzehn) Hinea. He married Estelle Hiatt. Charles appears in the 1910 federal census records in Ward 4 for Lafayette, Tippecanoe County, Indiana, where his occupation is noted as "Photographer" in the "Show Gallery" industry. Charles passed away at Lafayette on April 24, 1944, and his cremated remains were buried at Spring Vale Cemetery in Lafayette. John Walter Hisgen was the proprietor of The Hisgen Studio that was located at 17 Lincolnway in Valparaiso and later at 301 Monroe Street. The Hisgen Studio is known to have existed from 1923 to 1938. During the mid 1910s, Hisgen operated The Studio in Valparaiso in partnership with Harry J. Fox. John Walter Hisgen was born in Kentucky on April 11, 1879, the son of Hugo Hisgen and Emma (Balsover) Hisgen. He married Lucy Ann Mundt. John died on October 3, 1938, in Valparaiso, Porter County, Indiana, and was interred at Graceland Memorial Park in Valparaiso on October 5. Orange Judd Hockett owned and operated a photography studio in Kouts. His business is listed in the 1902 city directory for Valparaiso. It is believed that Hockett had lived briefly in Kouts with his brother, Kouts physician Clarkson Pierce "Doc" Hockett. No examples of Hockett's work have been found. Orange Judd Hockett was born in Grant County, Indiana, on July 18, 1878, the son of Henry Nordyke Hockett and Lavina (Hiatt) Hockett. The Federal Census of 1900 reveals that Orange was residing at Bryantown, Charles County, Maryland. Orange is enumerated as 21 years of age and born in Indiana; his occupation is listed as "Photographer." The 1920 Federal Census shows that Orange was residing in Union Township, Marshall County, Indiana, where he was engaged as a farmer. He married Eva Myrtle Wimpy on June 10, 1903; the marriage record notes Orange's occupation as "Photographer." Orange died on March 19, 1951, at Kalamazoo, Kalamazoo County, Michigan, and was interred in Riverside Cemetery in that city. Directory listing O. J. Hockett, a photographer located in Kouts. Porter County Business Directory, 1902. William Gottlieb Hoffman was a postcard publisher located in Chicago. Research suggests that his business was active from 1912 and 1924. Hoffman produced real photo postcards of a few locations situated in Porter and Chesterton. Hoffman's work was imprinted with Wm G Hoffman, Pub. 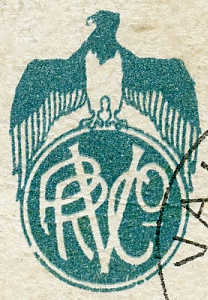 or an overlap of his initials, as shown in the example below. William Gottlieb Hoffman was born April 17, 1879 at Chicago, the son of Anton Hoffman and Wilhelmina (Becker) Hoffman. He married Aurelia M. Tatge at Chicago on November 29, 1905. William died in February 1951 and was interred at Memorial Park Cemetery at Skokie, Cook County, Illinois. Clara A. Hoyt is enumerated in the 1910 federal census for Westchester Township, Porter County, Indiana, and her occupation is noted as "Photographer." Hoyt is listed as a 34 year old single female residing on Valparaiso Street [Calumet Avenue] in Chesterton. Clara's obituary notes that "In 1907 she came to Chesterton from Valparaiso to engage in photographic work...." It is presumed that she discontinued her photography business when she married in 1912. Clara A. Hoyt was born April 10, 1876, at LaPorte City, Black Hawk County, Iowa, the daughter of James W. Hoyt and Ellen C. (Merrill) Hoyt. She married George R. Williams, a Chesterton attorney, on September 14, 1912. Clara passed away at 12:30 pm on March 10, 1927, at her home in Chesterton and was buried at Graceland Memorial Park in Valparaiso on March 13. Photograph of Clara A. (Hoyt) Williams. Clara was a photographer operating in Chesterton. Source: Find A Grave Memorial 31561948 (contributed by Eva Hopkins). 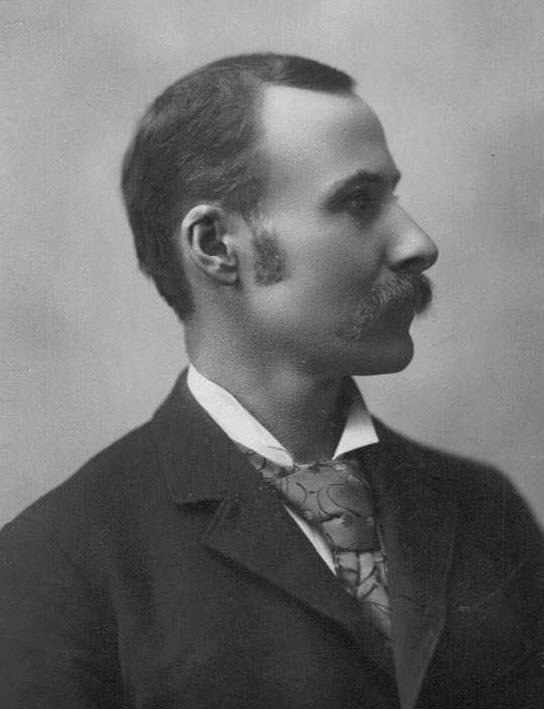 Percival Lowe Huckins was the proprietor of a publishing house located in Chicago. The company produced real photo postcards of locations throughout Porter County, though the majority of Huckins' photographs were of places situated in the northern one-half of the county. The company published other works as well, such as musical compositions and stationery. 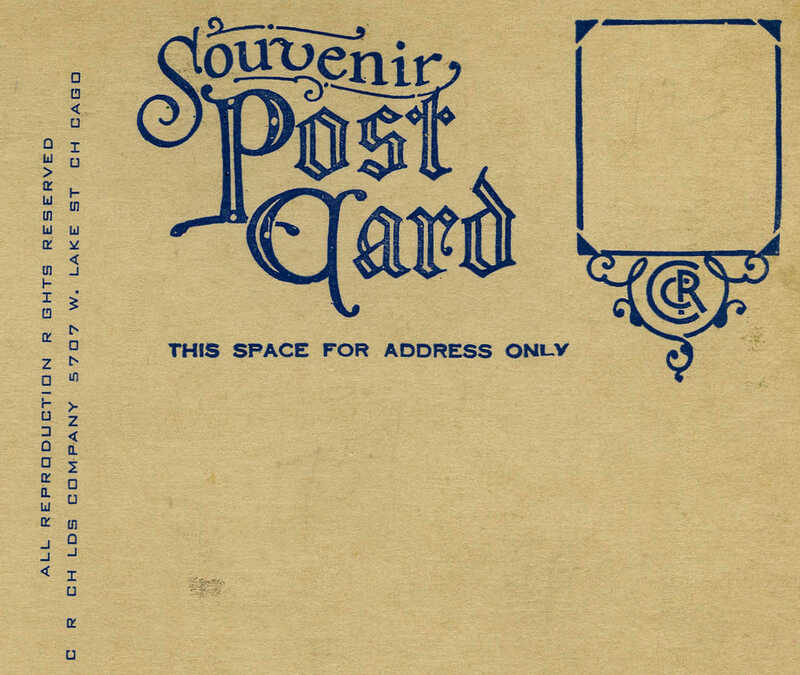 Huckins would produce large quantities of postcards that were then sold by retailers in Porter County. A large number of real photo postcards of the Indiana Dunes and Waverly Beach area were produced by Huckins. Huckins' postcards were imprinted with Made by P. L. HUCKINS. Percival Lowe Huckins was born March 10, 1868, in Kansas, the son of Alonzo A. Huckins and Frances Harriet (Dunlap) Huckins. On September 23, 1907, Huckins married Ida C. Palmer in Lake County, Indiana. Huckins died on October 1, 1932, at 111 West Huron Street in Chicago and was buried at Mount Muncie Cemetery in Lansing, Leavenworth County, Kansas, on October 3. Frank D. Hunt was a cabinet card photographer located in Chesterton, most likely during the 1880s and 1890s. Photographs of Hunt's work were imprinted with Hunt. Hunt left Chesterton prior to 1900 and took up residence at Watervliet, Berrien County, Michigan. Frank D. Hunt was born at Covert Township, Berrien County, Michigan, on June 27, 1858, the son of John A. Hunt and Lucy Ann (Whitcomb) Hunt. He married Anna Estelle Bowe on October 18, 1883, in Berrien County. Hunt died on June 12, 1927, at Kalamazoo, Kalamazoo County, Michigan, following an operation and was interred in Watervliet Cemetery on June 14. Marlin Francis Jackson was a cabinet card photographer located in Chesterton, most likely during the 1890s. Brief newspaper items concerning Jackson appear in issues of the Chesterton Tribune in 1895. Photographs of Jackson's work were imprinted with Jackson's. Marlin Francis Jackson was born September 25, 1867, in Whitley County, Indiana, the son of Allen Price Jackson and Sarah (Mygrant) Jackson. He married Grace A. 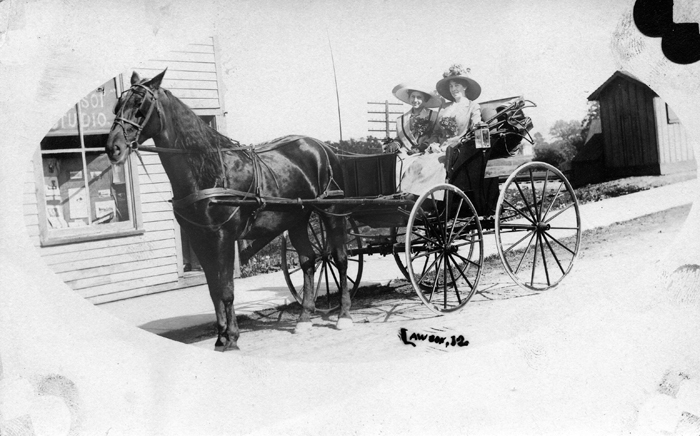 Way of Furnessville on June 5, 1892, in Porter County, Indiana. Jackson passed away on May 1, 1956, in Los Angeles County, California. Photograph of Grace A. (Way) Jackson and Marlin Jackson. Marlin was a photographer operating in Chesterton. Source: Oakland Tribune, May 28, 1932. Charles F. Jones had a partnership with his neighbor John N. Sigler selling dry goods and groceries at a general store located at Wheeler. They also produced postcards under the name Sigler & Jones, which they presumably sold at their store. Photographs were largely centered on the area in and around Wheeler. Jones and Sigler would dissolve their general store business in 1912. Jones then moved to Valparaiso where he resided for the remainder of his life. Charles Francis Jones was born September 22, 1846, in Chautauqua County, New York. He married Sophia Vader on October 8, 1869, at Boone, Boone County, Iowa. Jones died in Valparaiso on January 30, 1931, and is buried in that community at Graceland Memorial Park. The April 26, 1901, issue of The Chesterton Tribune states that "Robert Keagy, a brother of the pastor of the Porter Congregational church is here and is fitting up the Carlson building for a photograph studio. He is said to be an expert photographer." The name of Robert provided in this news item is incorrect and should be Rudolph Hayes Keagy. Little is known about Rudolph H. Keagy life in Porter County and no examples of his photographic work have been uncovered. Rudolph's brother, Franklin William Keagy, was the pastor of the Congregational Churches of Porter and Furnessville from 1900 to 1902; Franklin resigned his pastorate position at Porter and Furnessville on April 1, 1902, due to health reasons, but later in 1902 he assumed a pastoral position at the Congregational Church in Roseville, Warren County, Illinois. Federal Census data from 1900 and 1910 show that Rudolph was residing in Stark County, Ohio. Both of these census enumerations list Keagy's occupation as "Photographer." Hence, it is likely that Rudolph followed his brother Franklin to Porter and left the community when Franklin moved to Illinois in 1902. Rudolph Hayes Keagy was the son of Henry and Margaret E. (Moore) Keagy and was born July 30, 1877, in Chambersburg, Franklin County, Pennsylvania. He never married and died as a result of tuberculosis on June 22, 1923, in Massillon, Stark County, Ohio. Rudolph was buried at Rose Hill Cemetery in Altoona, Blair County, Pennsylvania, on June 25. J. H. King is believed to have been a amateur photographer. Three examples of his work, all views of tornado damage in Kouts and Hebron produced in 1917, are known to exist. King's postcards were imprinted with J. H. KING and KING. William Ashbelle Knapp was enumerated in the 1910 federal census for Center Township, Porter County, Indiana, as a 27 year old married male photographer. The census data indicates that Knapp operated his own business and that it was located on Main Street [Lincolnway] in Valparaiso. Knapp would die less than five months after being enumerated in the census on September 13, 1910, at Valparaiso. William Ashbelle Knapp was born on May 26, 1882, in Indiana, the son of William H. and Hannah E. (Pumroy) Knapp. Knapp married Clara Belle Hickok on September 28, 1904. William is buried at Graceland Memorial Park in Valparaiso. 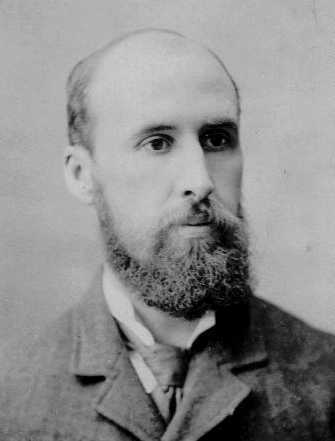 Photograph of William Ashbelle Knapp. William was a photographer operating in Valparaiso. Source: Ancestry.com (contributed by C. Bischoff). H. Kopplemann was the proprietor of the Imperial Gallery, which was located at 21 West Main Street in Valparaiso. Photographs from this studio were marked H. Koppelmann and IMPERIAL. 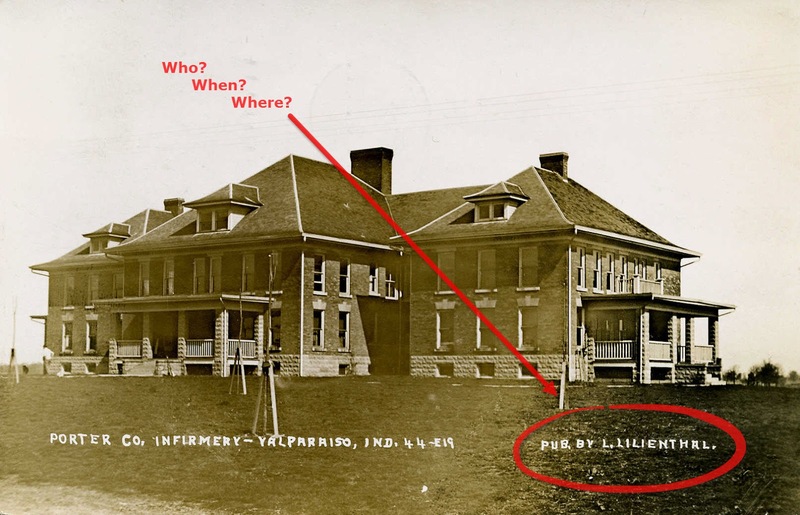 The Imperial is listed in the city directory for Valparaiso in 1885. Research into the identity of H. Koppelmann has been inconclusive, but it is believed that this individual may have been Herman Kopplemann. Herman appears in the 1880 Federal Census for New York City, and the 1910 and 1920 Federal Census records for Chicago. Census records indicate that Herman was born in Prussia (Germany) around 1862 and emigrated to the United States in 1878. All three census records indicate that Herman's occupation was "Photographer." Two LaMont photographs are known to exists, the subject matter of both being postcards of Waverly Beach at the Indiana Dunes. It is believed that these two postcards were created in the 1920s. LaMont's worked was imprinted as LA MONT PHOTO. Research concerning LaMont has not been conclusive with regard to his or her identification. Gustave "Gus" Alfred Lawson owned a photography studio in Chesterton located at 748 Valparaiso Street, known today as Calumet Avenue. The exact years that Lawson was operating his studio is unknown, but several photographic postcards that he produced suggest that his business was operating in 1912 and 1913. 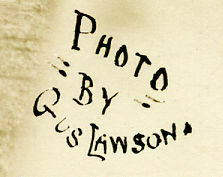 Lawson photographs were imprinted with LAWSON and PHOTO BY GUS LAWSON. Note that Joseph Marion Harkless operated a photography studio from the same location in the 1890s through 1900; it is possible that Lawson purchased business upon Harkless' death in 1909. Gustave Alfred Lawson was born August 12, 1867, at Baillytown, Porter County, Indiana, the son of Anna Lawson. In 1889, he married Ida Charlotte Lindeen. Lawson died at Valparaiso on April 11, 1918, due to pneumonia. His death certificate indicates that he was buried at Porter Station Cemetery on April 15, which is likely is the Augsburg Lutheran Church Cemetery. No tombstone marks Lawson's burial location; his wife Ida's tombstone, however, is located within this cemetery. 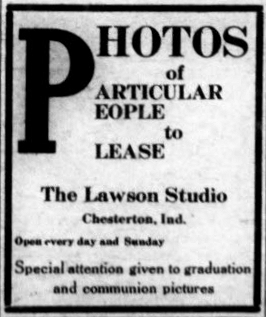 Advertisement for The Lawson Studio in Chesterton, Indiana. Source: The Chesterton Tribune, April 3, 1913.
north of the Lake Shore & Michigan South Railway tracks, 1912. Source: Collection of Gordon D. Rogers. Leopold "Leo" Lilienthal produced high quality real photo postcards of Valparaiso locations between 1908 and 1913. Most of these real photo postcards were imprinted with L. LILIENTHAL, though some were imprinted with LILIENTHAL & SZOLD. Leo formed a retail business partnership in Valparaiso with his brother-in-law, Louis Szold, operating as the the Lilienthal & Szold Department Store. For period of time, Leo was the director of the Valparaiso Standards baseball team. Leo and his wife Minnie (Rosenak) Lilienthal would later move to Michigan City, LaPorte County, Indiana, where they opened a ladies' ready-to-wear retail store. Soon after the conclusion of WWII, Leo and Minnie would move to Daytona Beach, Volusia County, Florida. Leopold Lilienthal was born in 1869 in Hungary and emigrated to the United States in 1898. Lilienthal married Minnie Rosenak in Chicago in 1897. He died on April 10, 1951, at Daytona Beach, Volusia County, Florida, and was buried at Mount Sinai Cemetery in Daytona Beach. Leo and Minnie were the parents of David Eli Lilienthal, who served as the director and later chairman of the Tennessee Valley Authority (TVA) from 1933 to 1946 and then served as the first chairman of the United States Atomic Energy Commission. An individual with the surname of Lytle worked in partnership with Edmond Edway Wonser producing photographs from their business location at 20 Locust Street in Valparaiso. Several individuals with the surname Lytle resided in Porter County at the time the studio is believed to have been in business, circa 1895 to 1900, and research concerning Lytle has yet to lead to a positive identification. Photographs produced by this partnership were imprinted with Wonser & Lytle. 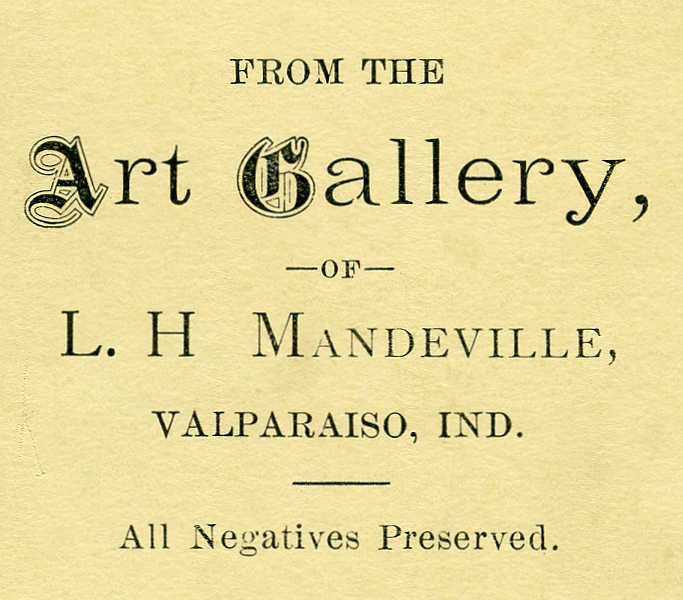 Lewis H. Mandeville was a prominent early photographer in Valparaiso. 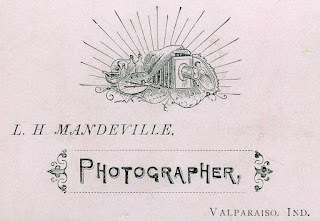 Mandeville operated a photography studio on North Washington Street during the mid to late 1880s through at least 1905. He resided at 22 West Chicago Street and later at 38 West Chicago Street, Valparaiso. 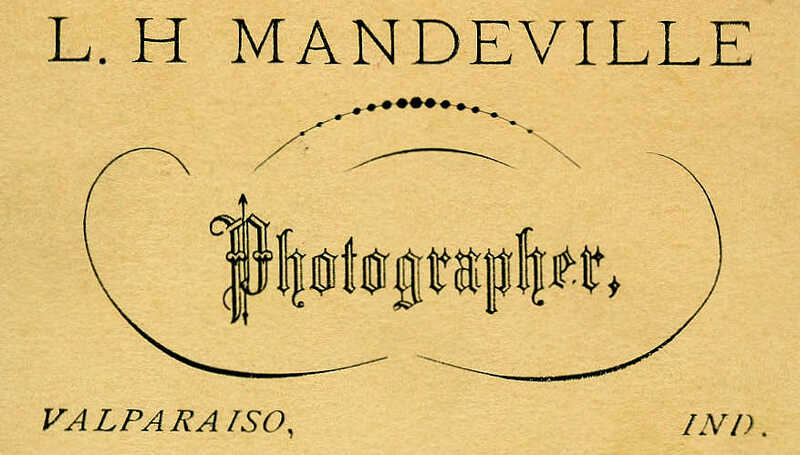 Mandeville imprinted all of his photographs with L. H. MANDEVILLE. 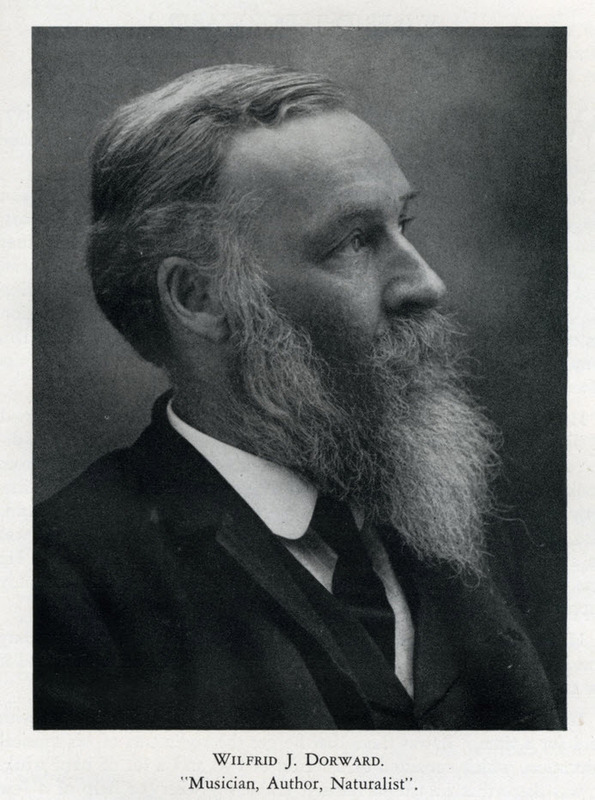 Lewis H. Mandeville was born at Trumansburg, Tompkins County, New York, on January 15, 1823, the son of Thomas Clark Mandeville and Mercy (Gilbert) Mandeville. In 1838, Lewis migrated west to Erie, Erie County, Pennsylvania, where he married Sara Jane Brown in 1850. Lewis and Sara then moved to Adrian, Lenawee County, Michigan, where Lewis farmed. They then moved to Tecumseh, Lenawee County, Michigan, where Lewis operated a hotel for about one year. The Mandevilles arrived in Valparaiso on May 5, 1855. 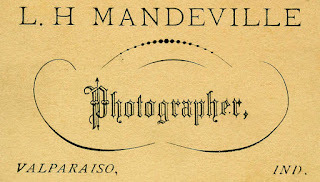 During the late 1850s, Mandeville was trained in photography at Chicago by Clark H. Lillibridge, a noted pioneer in daguerreotype, ambrotype, and ferrotype photography whose studio was located at 75 Lake Street. Lillibridge is reportedly one of the first photographers in the United States to use paper for producing photographic prints. Mandeville was well known as being very mechanically inclined and an inventor. A death notice for Mandeville states that he "is said to have invented the first grip car [railway cable car]. He built two or three miniature railways and two steamboats and is said to have brought the first sewing machine to Valparaiso. He invented a balance valve for steam engines and still later worked out a wonderful telephone model." Lewis H. Mandeville died at Valparaiso on December 25, 1906, and was interred at Union Street Cemetery in Valparaiso. Morris L. Masure owned and operated the M-L Photo Company in Chicago. M-L Photo Company was a very prolific publisher of real photo postcards taken of locations throughout Illinois and Indiana. Nearly all of the company's postcards were imprinted with either M.L. PHOTO or M-L Photo Co. Bel-Park Photo was later housed in the M.-L. Photo Company building located at 2837 Milwaukee Avenue in Chicago. It is possible that M.L. in the company represents Masure's initials. However, some researchers believe that it may represent the initial of a partner in the company whose surname was either Leonhard or Leonard. Masure was operating a photography studio in Chicago in partnership with Frank G. Spengler as early as 1895, and then had his own studio in the city beginning in 1897. The 1910 federal census for Ward 25 in Chicago enumerates Morris L. Masure as 45 years old and single; his occupation is listed as a "Photographer" in the "Photo Station" industry. Morris L. Masure was born on October 6, 1869, in Germany, the son of Solomon and Cecelia (Placzek) Masure. He married Cyrene Archambault on September 6, 1915, in Kane County, Illinois. Masure died at Aurora, Kane County, Illinois, on March 13, 1943, and was interred at Forest Home Cemetery in Forest Park, Cook County, Illinois, on March 15. John F. Maxwell was born at Saint George, Tucker County, West Virginia, on February 16, 1867. 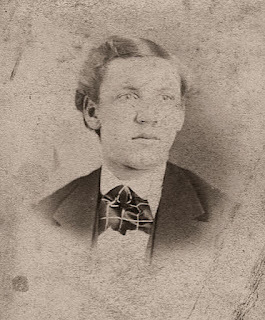 He would marry Iona V. Piper on July 31, 1894, at Osceola, Clarke County, Iowa. Soon after his marriage, Maxwell moved to Valparaiso and operated a photography studio for one year, 1895. In 1896, Maxwell would move to Fresno, Fresno County, California, to open a photography studio in that city. He would partner with Achilles Colfax "A. C." Mudge, of Valparaiso, to form a business venture in Fresno in 1898 that they named Maxwell & Mudge. As of 2017, this photography studio is still in operation in Fresno operating under the name of Maxwell Studio. Maxwell would pass away on March 17, 1955, in Fresno County, California, and be interred Mountain View Cemetery in Fresno. Photograph of John Franklin Maxwell. Source: Collection of Chuck Uebele. 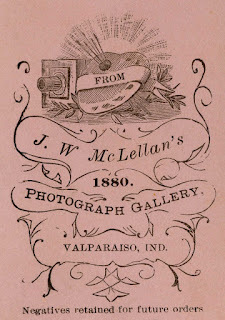 John Wesley McLellan operated a photographic studio in the Empire Block of East Main Street [Lincolnway] in Valparaiso. His earliest known work is from 1873. 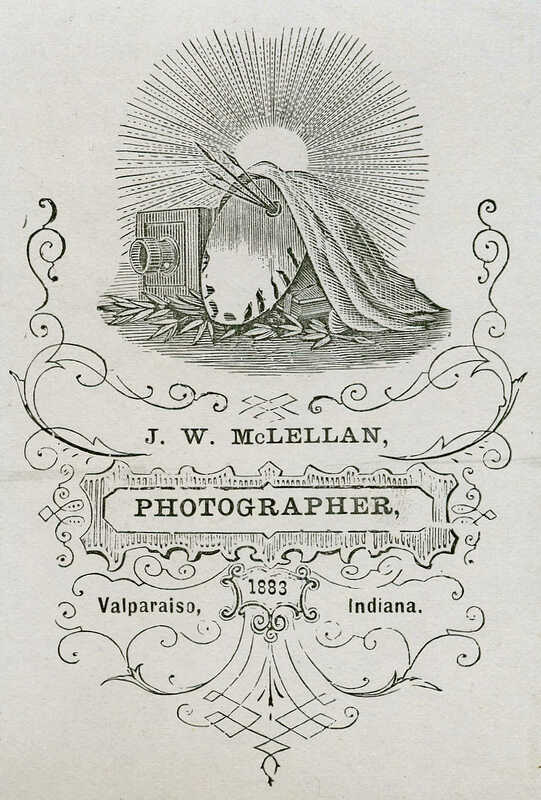 He is listed as a photographer in the city directory for Valparaiso in 1885. 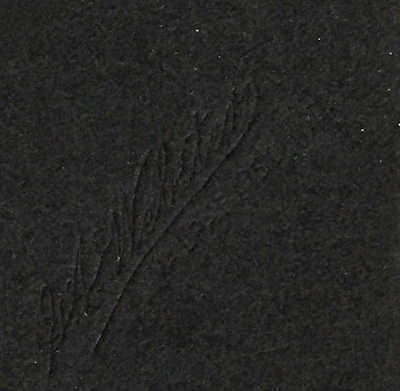 McLellan's photographs were imprinted with J. W. McLellan and J. W. McLELLAN. John Wesley McLellan was born in LaPorte County, Indiana, on August 2, 1848, the son Joseph McLellan and Fidelia (Reed) McLellan. He attended high school at Westville in LaPorte County for two and one-half years and then enrolled and graduated from the State Normal School at Oswego, Oswego County, New York. 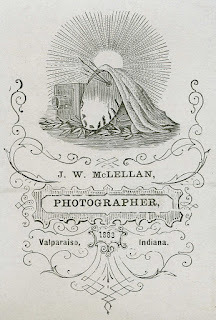 McLellan learned the photography trade from John Bryant at LaPorte and then opened a photography business at Rockford, Winnebago County, Illinois, for a short period of time. In December 1873, McLellan purchased the Valparaiso studio of Warren H. Hayward. On August 20, 1873, McLellan married Huldah A. Forbes. Around 1897, McLellan moved to Pasadena, Los Angeles County, California; he would pass away at 306 Henrietta Court in Pasadena on October 26, 1899, as a result of typhoid fever. On July 4, 1910, the late Charles McNay, former Valparaiso resident, while visiting here, took a picture of the first [interurban] car operated from Valparaiso to Flint Lake. Mr. McNay was a photographer. A large number of postcards were printed from his photographs. Interestingly, when the last interurban car operated on the same Valparaiso line in 1938, Charles' brother Mark McNay took photographs of that event while visiting from Los Angeles, Los Angeles County, California. Mark McNay is noted as being the first rural mail carrier out of the Valparaiso post office when rural mail service was established in 1898. Born in Indiana in 1853, most likely in LaPorte County, Charles A. McNay was the son of Robert McNay and Martha S. (Collins) McNay; the McNay family was residing in Valparaiso in 1860. In the 1870 Federal Census, Charles is enumerated as living with his uncle, John McNay, and working as a farm laborer in Cedar Creek Township, Lake County, Indiana. Charles is enumerated with a wife, Caroline "Carrie" M. McNay, in the 1910 Federal Census of Madison, Dane County, Wisconsin. He is listed with an occupation of photographer and had his own shop. A 1925 city directory for Madison indicates that Charles was still occupied as a photographer, his business being located at 227 Atwood Avenue and his home at 444 Clemons Avenue. Charles died on November 18, 1933 at his home located at 1939 West 48th Street in Kansas City, Missouri. His death notice published in the November 19 issue of The Kansas City Star states that he was "a retired photographer." The identification of the individual with the initial "H" imprinted with "Mc" on McNay's images is unknown, but may be George W. Hoffman who is listed as a Madison photographer in a 1911 business directory of Wisconsin. Willis Mead is enumerated in the 1900 federal census for Center Township, Porter County, Indiana, where his occupation is listed as "Photographer." At the time of this census, Mead was residing at 41 South College Avenue in Valparaiso. Mead may have been an employee for one of the photography studios operating in Valparaiso at that time. No examples of Mead's photographic work have yet been found. Willis Mead was born in Indiana in November 1875, the son of Martin Mead and Mahala (Yager) Mead. Additional effort in researching Mead's life has been fruitless. 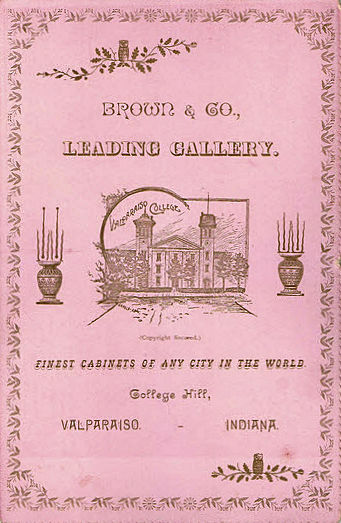 A Miss V. Millikin is listed as a photographer located at 457 College Hill in Valparaiso in the Porter County directory of 1905. Millikin may have been a student at Valparaiso University and conducted a photography studio while studying at the institution. One photograph and one postcard are known to exist that are imprinted with C. F. Moses, a photographer in Valparaiso, Indiana. It is strongly believed, but not confirmed, that this individual is Charles Francis Moses. Dating of the images suggests that Moses was producing photographs in Valparaiso between 1908 to 1912. Charles Francis Moses, a son of Emanuel B. Moses and Laura C. (Smiley) Moses, was a native of Lawrence, Douglas County, Kansas, and born on June 6, 1888. He married Teresa Jane Burns at Kankakee County, Illinois, on September 21, 1910. An Indiana State Board of Health Certificate of Birth issued for Ancel Moses on October 12, 1912, indicates that Charles and Theresa were residing at 455 College Avenue in Valparaiso; the certificate notes Charles' occupation as telegraph operator. Charles passed away on July 2, 1972, at Deshler, Henry County, Ohio, and was interred at Woodlawn Cemetery in Deshler. Achilles Colfax "A. C." Mudge managed his brother Marion's photography studio located in Valparaiso during the 1890s. A column published in February 1897 in Wilson's Photographic Magazine, a trade publication, states "Mr. A. C. Mudge, who has had several years' practical experience in the management of his brother's gallery at Valparaiso, Ind., desires a position where his capabilities will find appreciation." In 1898, A. C. Mudge would form a business partnership with John Franklin Maxwell they named Maxwell & Mudge in Fresno, Fresno County, California. As of 2017, this photography studio is still in operation in Fresno operating under the name of Maxwell Studio. A. C. Mudge was born in Pipestone Township, Berrien County, Michigan, on May 27, 1868, the son of Andrew Mudge and Lucinda (Cross) Mudge. He was the brother of two other Valparaiso photographers, Elsworth Linias Mudge and Marion M. Mudge. He married Minnie M. Fellows at Grant, Newaygo County, Michigan, on May 20, 1891. A. C. died on January 8, 1963, at Fresno, Fresno County, California, and was interred at Mountain View Cemetery in Fresno. Photograph of Achilles Colfax Mudge. Source: Collection of D. Garcia. Elsworth Linias "E. Lynn" Mudge was a photographer in Valparaiso, likely working in partnership with his brother, Achilles Colfax "A. C." Mudge. He is listed as L. E. Mudge in the 1893 Valparaiso City Directory. Mudge was residing at 13 East Main Street [Lincolnway] in Valparaiso. Elsworth Linias Mudge was born March 1, 1873, in Newaygo County, Michigan, the son of Andrew Mudge and Lucinda (Cross) Mudge. He was the brother of two other Valparaiso photographers, Achilles Colfax Mudge and Marion M. Mudge. He died at Chattanooga, Hamilton County, Tennessee, on August 21, 1921. Photograph of Elsworth Linias Mudge. 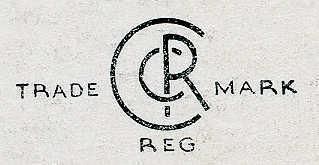 Marion M. "M. M." Mudge was the proprietor of a photography studio in Valparaiso from 1887 to 1937. Mudge typically marked his photographs M. M. Mudge and M. M. MUDGE. Mudge's studio was located at 59 West Main Street [Lincolnway] in the Empire Block. Marion M. Mudge was born February 10, 1859, at Grattan, Kent County, Michigan, the son of Andrew Mudge and Lucinda (Cross) Mudge. He was the brother of two other Valparaiso photographers, Achilles Colfax Mudge and Elsworth Linias Mudge. Marion passed away at Dayton Beach, Volusia County, Florida, on November 23, 1950, and was buried at Union Street Cemetery in Valparaiso. Photograph of Marion M. Mudge. Numerous real photo postcards taken circa 1910 at or near the vicinity of the Kankakee River in Porter County and Jasper County are imprinted with NELSON. It is possible that these postcards were produced by Roy Elmer Nelson. Roy Elmer Nelson appears in the 1910 federal census for Westchester Township, Porter County, Indiana, as Roy Nelson, a 19 year old single male photographer with his own business. At the time of the census, Roy was living with his divorced mother, Helena F. Nelson, on Valparaiso Street [Calumet Avenue], where she was running a news stand and candy store. Thus, it is probable that Roy was managing his photography studio from his mother's business. Nelson imprinted his work with Photo By R. E. Nelson. Roy Elmer Nelson was born December 11, 1890, at Los Angeles, Los Angeles County, California, the son of Claus T. and Helena F. Nelson. He would marry Anna Anderson in Porter County on August 28, 1918. Roy passed away at the age of 27 on January 29, 1918, at Chesterton, Porter County, Indiana, a victim of the influenza pandemic of 1918. Arthur E. Nickel owned a drug store in Chesterton that sold postcards featuring views of the surrounding community, such as schools, street scenes, and mineral springs. It is uncertain as to whether Nickel produced the photographs or merely purchased photographs and published them as postcards to be sold at his retail establishment. Postcard photographs published by Nickels have been found with postmarks dating as early as 1907 and as late as 1913. The postcards are imprinted with Arthur E. Nickel, Publisher. Arthur E. Nickel was born at Chicago on February 7, 1883, the son of Karl Nickel and Louise (Gutperlet) Nickel. At the age of 16, Arthur began to the learn the trade of druggist. He would then graduate from the Valparaiso University School of Pharmacy. He married Amanda Graubman on June 10, 1905, and soon after the marriage Arthur and Amanda would open their first drug store in Chesterton in the former Eschenbach restaurant building. In 1914, Nickel would have a new drug store built at the corner of Third Street and Broadway Avenue. The drug store was operating as late as September 1955. Nickel passed away on July 8, 1959, at Porter Memorial Hospital in Valparaiso and was interred at Chesterton Cemetery on July 11. A photograph likely taken in the 1880s or early 1890s in imprinted with BROWN & OTTNAT, located on College Hill. The Brown in this partnership is believed to be Henry A. W. Brown. Research has not positively identified Ottnat. Peters was a cabinet card photographer located in Chesterton, most likely during the 1880s and 1890s. Photographs of Peters' work were imprinted with Peters. Research has failed to determine the identity of this photographer. Vernon Lanford Philley is enumerated in the 1900 federal census for Center Township, Porter County, Indiana, where his occupation is listed as "Photographer." 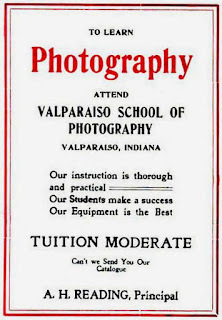 Philley may have been an employee for one of the photography studios operating in Valparaiso at that time. No examples of Philley's photographic work have yet been found. From 1947 till his death in 1964, Vernon was the president of Philley Manufacturing Company, Inc., located at 5 Lafayette Avenue in Valparaiso; this company manufactured aprons. Vernon Lanford Philley was born at Fort Wayne, Allen County, Indiana, on March 10, 1881, the son of William H. Philley and Flora Ada (Smith) Philley. He married Mildred M. Archer on June 26, 1918, at DeKalb, DeKalb County, Illinois. Philley passed away at his home located at 1202 Forest Park Avenue in Valparaiso on June 20, 1964, and was interred in Graceland Memorial Park in Valparaiso on June 23. One Porter County example, a photograph of the Christian Church at Boone Grove, is known to have been taken by a photographer named Phillips who operated a studio at 3986 Vincennes Avenue in Chicago. The photograph is imprinted with the stamp mark PHILLIPS, PHOTOGRAPHER, 3986 VINCENNES AVE, CHICAGO. Taken together, the 1900 and 1910 federal census records suggest that the photographer was John C. Phillips. Born in July 1845, the son of Phinehas Phillips and Susanna (Hudkins) Phillips, John married Mary A. Apt in 1871. John served as auditor of Fulton County, Indiana. Phillips died on October 29, 1903, at Rochester, Fulton County, Indiana, and was interred at the Rochester I.O.O.F. Cemetery on October 31. The 1900 federal census shows that John and his family were living in Rochester, where John was employed as a clerk in a store. However, the 1910 federal census, after John had died, shows his family living on the 3900 block of Vincennes Avenue in Chicago. Glen Lacy Phillips was a partner of the P. & H. Drug Store in Chesterton with Joseph "Joe" Hammond Heward. This drug store produced a series of real photo postcards in February 1921 of the New York Central and Michigan Central train wreck in Porter, Indiana. These real photo postcards, which were taken by Phillips, were imprinted with P. & H. DRUG STORE. The drug store also produced a series of postcards taken at Waverly Beach along Lake Michigan. In 1929, P. & H. Drug Store was dissolved and Phillips would then open his own independent drug store in Chesterton called Phillip's Drug Store. Glen Lacy Phillips was born May 10, 1890, at Frankfort, Clinton County, Indiana, the son of Harry Cyrus Edward Phillips and Nancy Catherine (Daniel) Phillips. After working at a Hook's Drug Store in Lafayette, Tippecanoe County, Indiana, he arrived at Chesterton around 1920 to open a drug store. He married Ethel May Props at Hillsdale, Hillsdale County, Michigan, on June 22, 1913. Glen died on November 8, 1934, at Chesterton and was buried at Chesterton Cemetery on November 11. Jacob E. Portmess was the proprietor of the Imperial Studio. It is is believed, though unverified, that Portmess sold his business to Allen Ellsworth Hayes around the mid 1890s and Hayes renamed it the Imperial Art Studio. The Federal Census for 1870 shows that Jacob Portmess was residing in Clay County, Illinois, where his profession is listed as "Artist." By February 1877, Portmess was residing at Plymouth, Marshall County, Indiana, where he was the proprietor of the Centennial Photograph Gallery; the 1880 Federal Census for Plymouth indicates his occupation as "Photographer." 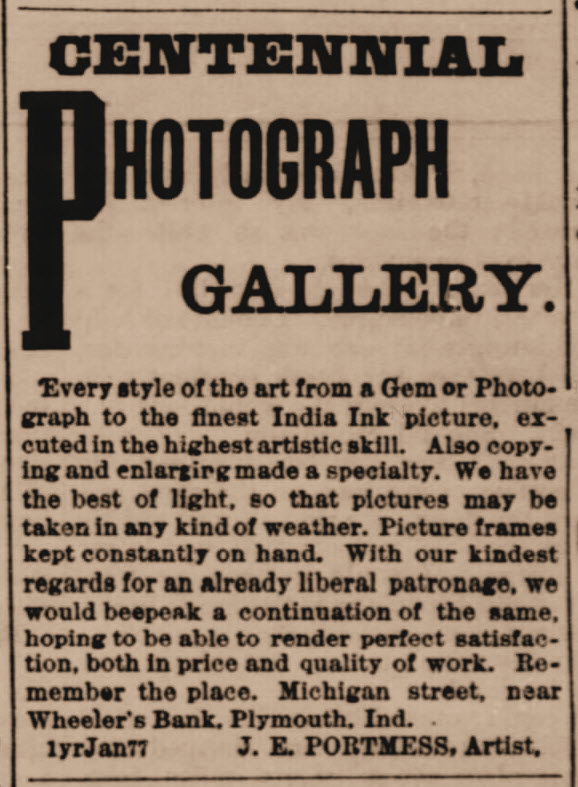 A short news item published on March 6, 1886, in The Bremen Enquirer of Marshall County, Indiana, states that "J. E. Portmess is now carrying on the photograph business since Mr. Brown left." Another news item in the same newspaper published on September 22, 1888, reports that "J. E. Portmess intends to move to Hobart, Ind., in a couple of weeks." Collectively, evidence suggests that Portmess moved to Hobart in late 1888 and soon after established the Imperial Studio at nearby Valparaiso. Jacob E. Portmess was born at Spring Gap Mountain, Hampshire County, Virginia (now West Virginia) on December 6, 1834, the son of John Portmess and Ruth (Easter) Portmess. He married Frances Anna Griffith on February 12, 1874, at Angola, Steuben County, Indiana. Portmess died on May 27, 1917, at Hobart, Lake County, Indiana, as a result of heart disease and was buried in Crown Hill Cemetery in Hobart. Portmess was earning a living as a painter at the time of his death, most likely as an artist. Gallery in Plymouth, Marshall County, Indiana. Source: The Weekly Republican, February 8, 1877. Adelbert Henry Reading owned and operated the Valparaiso School of Photography at 13 Main Street [Lincolnway], where he taught photographic techniques and sold photography supplies. The photography school was established in 1902. Reading was likely Valparaiso's most prolific photographer during the early 1900s. 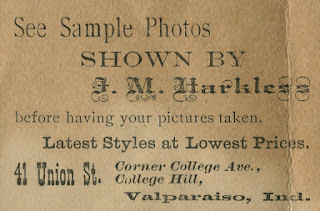 In the city directory for Valparaiso published in 1902, Reading advertised that photographs ranging in sizes from "Locket to 25x30 inches" could be produced at his studio. He also advertised that his studio had "The largest Camera in the state." Reading's school was still operating as late as 1928, and his studio continued producing photographs in 1939. Reading also briefly maintained a photography studio at Knox, Starke County, Indiana. Reading typically imprinted his photographs with A. H. Reading, A. H. Reading Studio, or simply Reading. Reading also participated in the production of motion pictures. Newspaper account indicate that he produced a film of a parade that took place in Valparaiso. 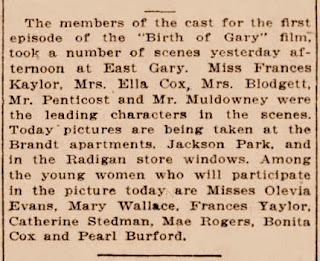 He also produced a film titled Birth of Gary in 1917, which premiered at Gary's Cosmo Theatre on December 5, 1917. 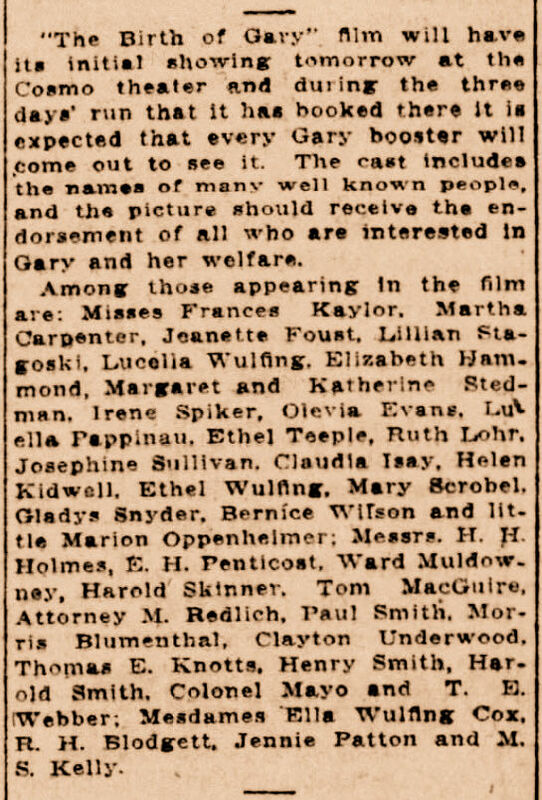 Portions of this motion picture were filmed in Porter County's East Gary [now Portage]. It is believed that none of Reading's motion pictures exist. 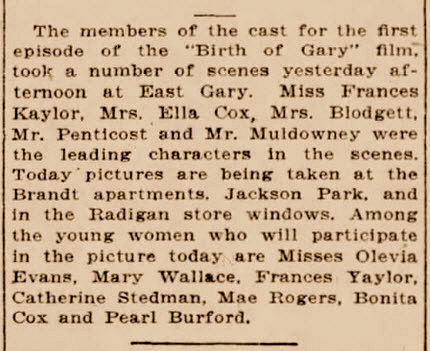 Birth of Gary, which was filmed by Adelbert H. Reading. Source: The Lake County Times, November 10, 1917. Source: The Lake County Times, December 4, 1917. Adelbert Henry Reading was born May 26, 1872, at Crown Point, Lake County, Indiana, the son of Byron Edwin Reading and Anna Margaret (Spaulding) Reading. He died on December 15, 1955, at Safety Harbor, Pinellas County, Florida. 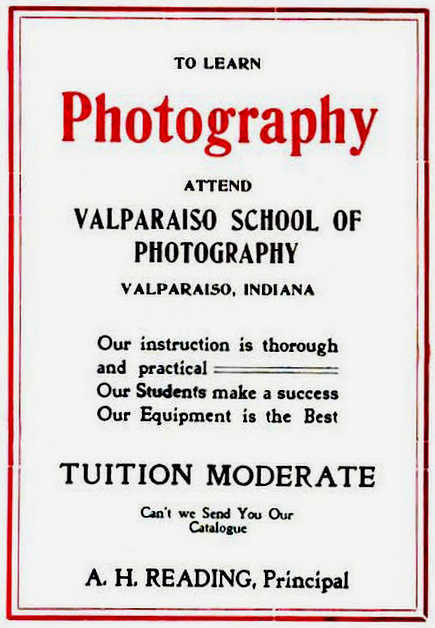 Advertisement for A. H. Reading's Valparaiso School of Photography. Source: St. Louis and Canadian Photographer, 1903. 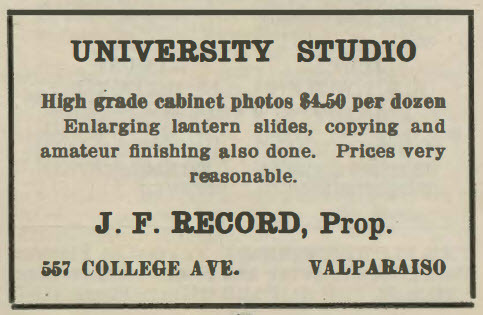 J. F. Record was the proprietor of the University Studio located 65 College Avenue in Valparaiso; the address of the studio was later at 557 College Avenue. It is known that the University Studio was in business during 1898 through 1915, but whether it was operating before and after these dates is unknown. The studio catered to university clientele. Research attempting to identify J. F. Record has been unsuccessful, but the name has been found to also appear as F. J. Record. It is possible that Record relocated his business in Wenona, LaSalle County, Illinois, in 1917. 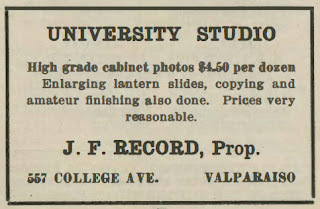 Advertisement for J. F. Record's University Studio in Valparaiso. Chicago photographer Charles Sansone established a studio and gallery at Kouts in February 1906; it is unknown how long he operated his business in the community. A search for Sansone's work and family information has yielded no results. 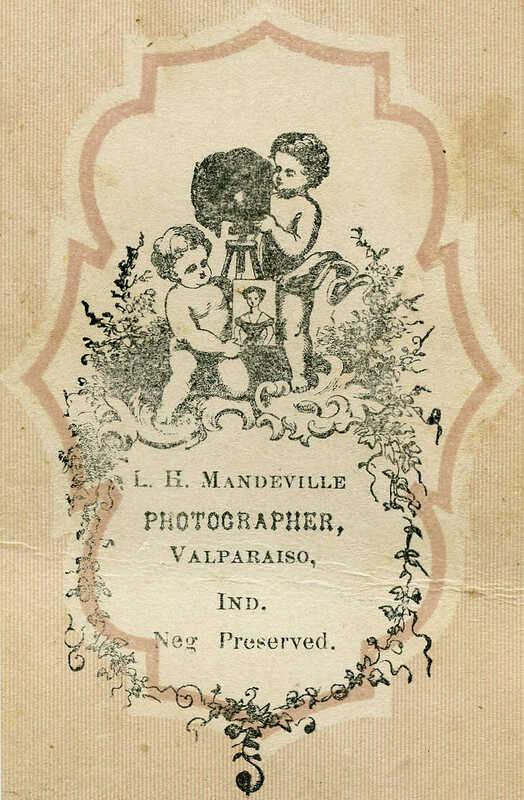 Bernhardt Schuldt operated a photography business at Valparaiso in partnership with Charles B. Hinea, their business being located at 17 East Main Street [Lincolnway]. The business was in operation in from the early 1890s to about 1901. Photographs from this partnership were imprinted as Hinea and Schuldt and Hinea & Schuldt. Bernhardt Schuldt was born May 21, 1874, in Valparaiso, the son of Peter Schuldt and Phoebe (Rathjens) Schuldt. Bernhardt passed away at Porter Memorial Hospital in Valparaiso on February 2, 1949, and was interred at Maplewood Cemetery in Valparaiso on February 5. Bernhardt's obituary mentions that "For many years he was engaged in the photography business in Valparaiso and Chicago. Later he took up railroad work and was employed in the offices of the EJ&E railroad in Gary, retiring June 30, 1939." Anthony J. "A. J." Schumann was a manufacturer of real photo postcards in Chicago. He produced several real photo postcards of communities located along Lake Michigan in Indiana, including Chesterton and Porter. Schumann imprinted his postcard with A. J. SCHUMANN. The 1910 federal census for Ward 7 in Chicago enumerates Schumann as a 31 year old "Proprietor" in the "Photographer Card Mfg." industry. Schumann had moved to New Jersey by 1930. According to 1940 federal census records, 61 year old Schumann was residing at North Brunswick, Middlesex County, New Jersey, where his occupation is listed as "Photographer" in the "Photo Finishing" industry. Anthony J. Schumann was born around 1879 in New York. He married Annie Schumann. Herbert Dudley Scofield was the proprietor of a general store located at Crisman, Porter County, Indiana, which he opened in 1892. The store also served as the Crisman post office. Scofield's real photo postcards were predominantly focused on locations in Portage Township in Porter County, Indiana, and he imprinted his images with Pub By H. D. Scofield. It is believed that Scofield produced the postcards to sell at his retail establishment. Herbert Dudley Scofield was born February 22, 1860, in Cook County, Illinois, the son of John Henry Scofield and Emma (Montrose) Scofield. He married Augusta Matilda "Mattie" Humphrey on May 30, 1883. Herbert died on July 20, 1928, at Crisman, Porter County, Indiana, and was buried at McCool Cemetery in Portage, Portage Township, Indiana, on July 22. Miss Lulu Seymour, who has been employed in some of the leading photograph studios of Michigan City and Laporte for the past two years, is now employed at the Chesterton photograph gallery. The "Chesterton photograph gallery" mentioned in the news item was likely the studio owned by Joseph Marion Harkless. Chesterton merchant Arthur E. Nickel produced several postcard scenes taken in the Chesterton and Porter area. Some of these postcards are imprinted with Photo by Semour, who was likely Lulu Seymour. Louise "Lulu" Seymour appears in both the 1900 and 1910 Federal Census enumerations for LaPorte, LaPorte County, Indiana, which suggests that she would travel to and from Chesterton by rail to work in Chesterton. The census data indicates that she was residing in LaPorte with her husband, Grant Seymour, who was employed as a moulder at the LaPorte Bicycle Works. Louise "Lulu" (Mackey) Seymour was born December 1851 in Wisconsin. She married Grant Seymour on April 18, 1881 at New Buffalo, Berrien County, Michigan. Lulu passed away at on October 20, 1919, at her home in LaPorte and was interred in Patton Cemetery in that community. Note that in some genealogical records that Seymour appears as Lucy. Arthur Waite Shook produced photographs and real photo postcards for a very short period of time at Chesterton. Shook marked his photographs as SHOOK PHOTO. The only examples of Shook's work are dated 1914. The September 10, 1914, and May 6, 1915, issues of the Chesterton Tribune include advertisements for this photographer. According to 1920 federal census records, Arthur was residing at Connersville, Fayette County, Indiana, where he is listed as a 29 year old whose occupation is "Photographer." Around 1945, Shook would move to Kissimmee, Osceola County, Florida, where he was the proprietor of the Shook Photo Shop till his death in 1964. Arthur Waite Shook was born March 29, 1890, in Ridgeway, Logan County, Ohio, the son of Lee Shook and Roxie (Baker) Shook. He married Edith Lillian Cotton on November 20, 1919, in Spencer County, Indiana, whom he divorced in 1922. During the 1940s, Arthur served as a deputy sheriff in Osceola County, Florida. Arthur passed away on September 8, 1964, and was interred at Rose Hill Cemetery in Kissimmee, Osceola County, Florida. 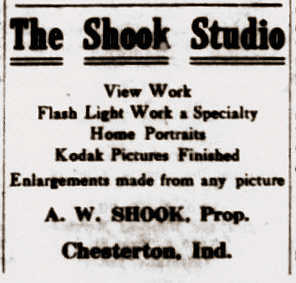 Advertisement for The Shook Studio in Chesterton, Indiana. Source: The Chesterton Tribune, September 10, 1914. John N. Sigler had a partnership with his neighbor Charles Jones selling dry goods and groceries at Wheeler. They also produced postcards under the imprint Sigler & Jones, which they presumably sold at their retail establishment. Photographs were largely centered on the area in and around Wheeler. Jones and Sigler would dissolve their general store business in 1912. John Nelson Sigler was born September 23, 1852, in Union Township, Porter County, Indiana, the son of Samuel and Nancy (Stockdale) Sigler. He married Frances Ophelia Obitts; when Francis passed away in 1899, John married a second time to Jessie V. Humes on June 25, 1901. Sigler passed away due to stomach cancer on May 10, 1914, at Chicago, Cook County, Illinois, and was buried at Janes Cemetery in Porter County's Union Township. Photograph of John Nelson Sigler. John was a photographer operating in Wheeler. The city directory for Valparaiso published in 1902 lists Miss Bird Simon as a photographer located at 41 Union Street. The 1905 directory for Porter County list a H. F. Bird as photographer located on Monroe Street near Morgan Avenue. It is possible that Bird Simon and H. F. Simon are the same individual. A graduate of the Valparaiso University class of 1902 was named Bird Simon. Research concerning this photographer has yielded little information. George L. Skinner is enumerated as a sixteen year old in the 1870 federal census for Center Township, Porter County, Indiana, where his occupation is listed as "Photographer." This census record reveals that Skinner was residing in the household of Lewis H. Mandeville. 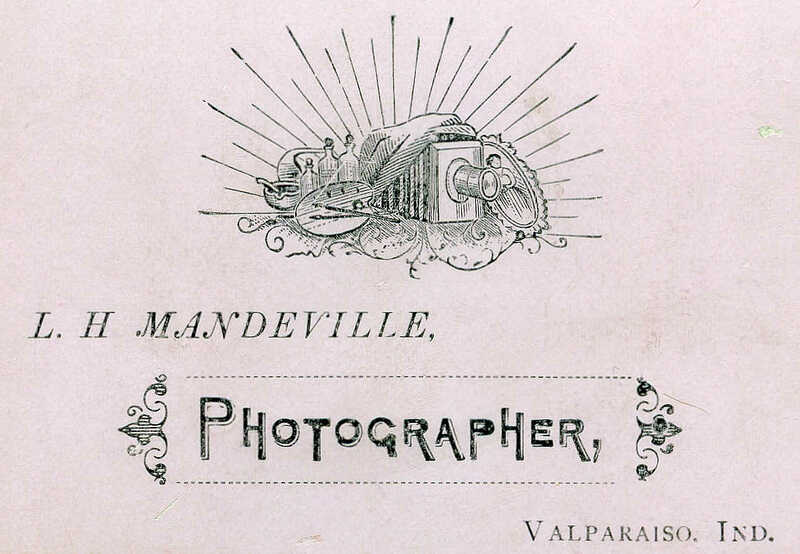 Mandeville was a prolific photographer operating in Valparaiso during the latter half of the 1800s. George L. Skinner was born in Pennsylvania in December 1853, the son of Chauncy A. Skinner and Abagail Rosa Skinner. He married Almira Olive Pace in 1874. It is believed that George and Almira later divorced. The 1900 federal census reveals that George and Almira were residing in Pueblo, Pueblo County, Colorado, where George was a employed as a deputy sheriff. George married on December 27, 1915, to Emily Holder at Salt Lake City, Salt Lake County, Utah. By 1917 George had moved to Brigham City, Box Elder County, Utah, where he was employed as an air compressor operator at a copper mine. According to Emily's obituary, George died in 1922. Harrison "Harry" R. Smith operated a mercantile business at 101 Broadway Avenue with his father, Myron B. Smith, for decades. Myron and Harry produced at least one postcard depicting the German Lutheran Church and parsonage in Chesterton, which they likely sold at their mercantile or perhaps gave to members of the church congregation. This postcard was produced circa 1910 and was inscribed M. Smith & Son. Harrison R. Smith was born August 6, 1877, in Porter County, Indiana, the son of Myron B. Smith and Harriet E. (Hill Smith). He married Anna E. (Morgan) Smith on June 11, 1901. Harrison died on November 10, 1961, at Chesterton and was interred in Chesterton Cemetery on November 13. Myron B. Smith was a rather prominent businessman in Chesterton where he operated a mercantile at the southwest corner of the intersection present day Calumet Road and Broadway Avenue (101 Broadway Avenue). 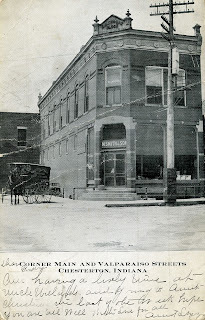 The Smith Building, where Myron's business was located, still stands and is considered a historic structure in downtown Chesterton's business district. Myron and his son, Harrison "Harry" R. Smith, produced at least one postcard depicting the German Lutheran Church and parsonage in Chesterton, which they likely sold at their mercantile or perhaps gave to members of the church congregation. This postcard was produced circa 1910 and was inscribed M. Smith & Son. Myron B. Smith was born January 12, 1852, in Wayne County, Ohio, the son of George B. Smith and Caroline (Baird) Smith. Myron married Harriet E. Hill at Valparaiso on November 1, 1876. On March 28, 1918, at Chesterton, Myron passed away; he was buried on April 1 in Chesterton Cemetery. located in the Smith Building on the Elias N.
Thomas Block of downtown Chesterton, 1907. 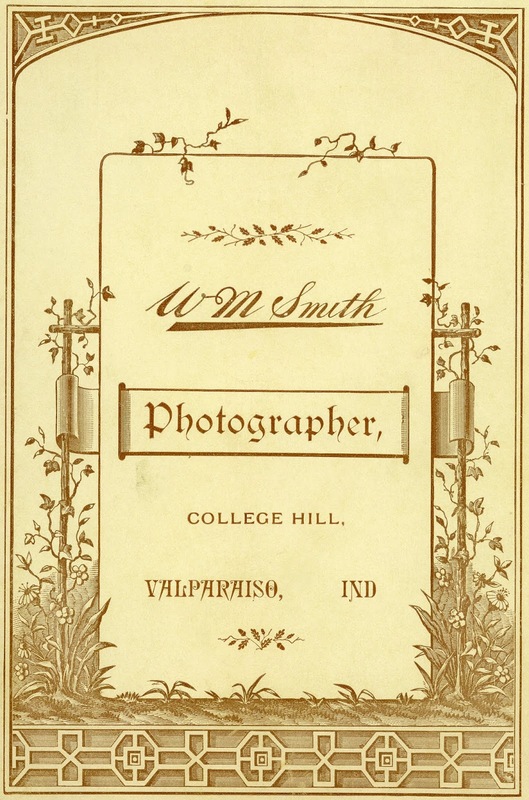 Willard M. Smith was the proprietor of a photography studio on College Hill in Valparaiso, which is believed to have operated at some point between 1890 and 1896. One cabinet card of Smith's work reveals that he concurrently operated a studio located in Englewood, Cook County, Illinois. 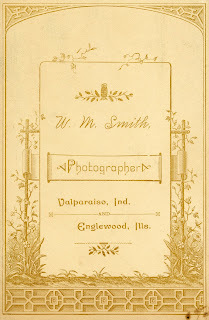 Willard M. Smith's Englewood photograph studio was established in 1890 and located at 418 West 63rd Street; prior to this Smith had a studio located at 3432 Cottage Grove in Chicago that was established in 1881. Smith would sell the Englewood business, likely in autumn of 1897, to one of his employees, Goldson White McWhinney, who operated the business until his death on June 5, 1907. 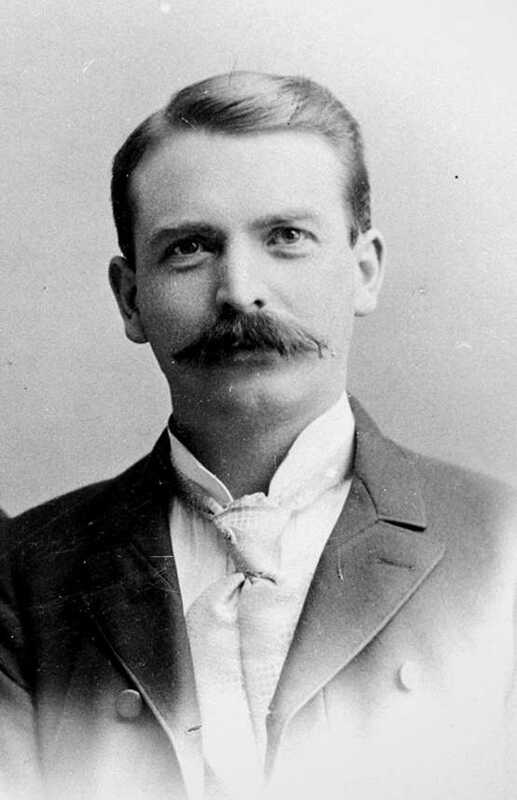 McWhinney began his employment with Smith around 1887. From 1896 to 1897, Charles A. Mayo, a well known Chicago photographer, was employed at Smith's Englewood studio. Mayo is especially known for his photographs of Alaska and the Pacific Northwest taken in the 1890s in association with J. E. Weed. Research concerning the life of Willard M. Smith has yielded little information. Jerome F. Snyder, a native of Illinois, attended Valparaiso University at the turn of the century. It is believed that he opened a photography studio in Valparaiso immediately after earning his degree. 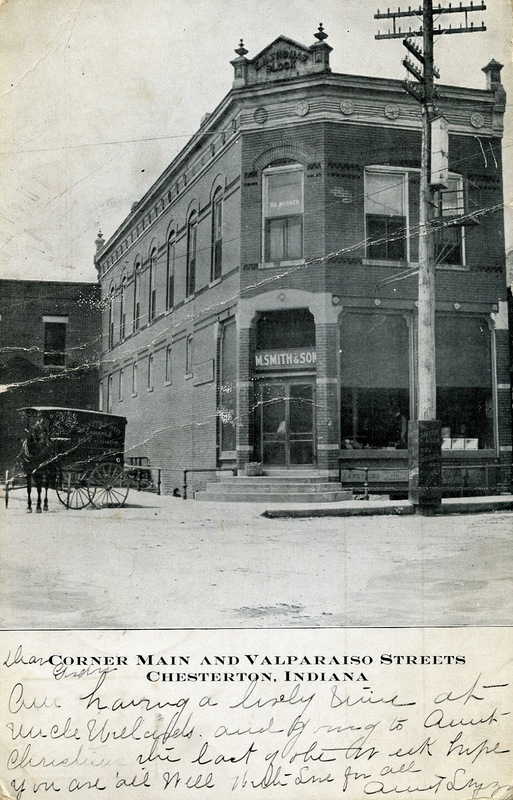 He may have purchased the G. A. Webster Studio at 17 Main Street [Lincolnway] since that is same location where his studio is listed in the Valparaiso City and Porter County Business Directory published in 1907. Snyder also sold photography supplies for amateurs from his studio. By 1910, however, Snyder was living with his parents and operating his own photography studio at Salina, Kankakee County, Illinois. Snyder's photographs were marked J.F. Snyder. Jerome F. Snyder was born August 4, 1872, the son of William A. Snyder and Margaret (Conrad) Snyder. Jerome passed away on December 21, 1948, in Cook County, Illinois, and was buried at Maple Grove Cemetery in Bonfield, Kankakee County, Illinois. Elmer Eugene Starr owned and operated The Varsity Shop at Valparaiso University. He sold the business to M. E. Zimmerman in 1924. Elmer was also a jeweler, which was his primary line of business. 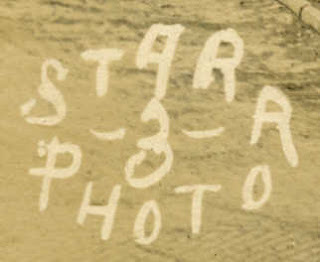 Evidence suggests that Starr exited the photography business prior to the 1920s. Starr produced one of the most unique and collectible postcard imprints of any postcard producer in the United States (see below). 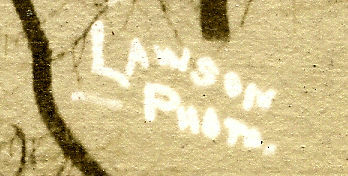 The imprint shows the "Lover's Repose" bridge over the Pennsylvania Railroad tracks in Valparaiso; this bridge connected Valparaiso University with the Sager's Lake area. Imprints of Starr's work include Starr, STARR PHOTO, Photo by Elmer Starr, and ELMER E. STARR. Elmer Eugene Starr was born in Porter County, Indiana, in 1873. He married Gertrude Lydia Barker on January 31, 1901, at Milwaukee, Milwaukee County, Wisconsin. Elmer died on January 21, 1953, in La Mesa, San Diego County, California. He was buried in the Mount Hope Cemetery in San Diego. 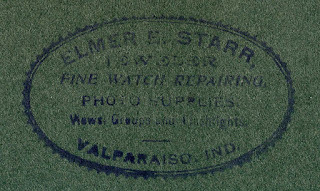 Advertisement for Elmer E. Starr's photo supplies and views. Louis Szold produced high quality real photo postcards of Valparaiso locations from approximately 1910 to 1913 in partnership with Leopold "Leo" Lilienthal. Szold's real photo postcards were imprinted with LILIENTHAL & SZOLD. Louis had formed a retail business partnership in Valparaiso in 1905 with his brother-in-law, Leo Lilienthal, operating as the the Lilienthal & Szold Department Store. The partnership between Szold and Lilienthal dissolved in 1913. Szold continued his retail operation independently as Szold Department Store and disposed of his business in 1929. It is believed that Szold did not take the photographs imprinted with his name. Rather, the photographs were taken by his business partner, Lilienthal, and published by the business partnership. Louis Szold was born April 18, 1868, in Pressburg, Hungary, the son of Bernard Szold and Amalia (Menzer) Szold. Today, Pressburg is known as Bratislava, Slovakia. Szold married Olga E. Radozy on January 12, 1896, in Chicago. He died from pneumonia on January 19, 1947, at his home located at 208 Washington Street in Valparaiso. Louis was interred at Acacia Park Cemetery in Chicago on January 21 after funeral services in Valparaiso. Herbert Edgar Veach was a photographer employed by the G. A. Webster Studio located at 17 East Main Street [Lincolnway] in Valparaiso. 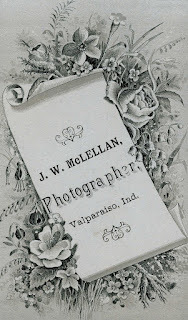 Veach is listed in the city directory for Valparaiso in 1902 as a photographer. Veach would later move to Delaware County, Indiana, where he would operate his own photography studio. Herbert Edgar Veach was born September 8, 1881, in Indiana to Jerry V. Veach and Sarah (Shipley) Veach. He died at the Delaware County Home at Muncie on August 3, 1957, having resided there the previous eighteen years. Herbert was interred at the Beech Grove Cemetery in Muncie on August 6. The death certificate issued for Herbert lists his occupation as photographer. Paul Richard Vogel owned and operated the Paul R. Vogel Company located at 2343 Irving Park Boulevard in Chicago. His company sold postcards, greeting cards, and display items to drug, candy, dry goods, and stationery stores in the Chicago region. Vogel's greeting cards were sold under the Charm Craft brand. Several postcards of Valparaiso were produced and distributed by the Paul R. Vogel Company, the earliest known postcard being postmarked in 1911. 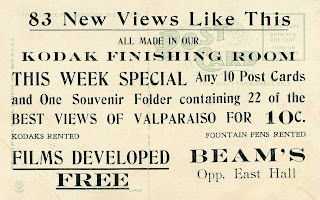 Real photo postcards of Valparaiso were produced and sold by Vogel as late as the early 1940s, and his company was still selling greeting cards as late as 1959. Most of Vogel's work was imprinted with PAUL R. VOGEL CO.
Paul R. Vogel was born in April 15, 1886, in Germany. He married Hannah H. Winkler in Chicago on June 11, 1916. Paul died in Florida in 1965 and was interred at Hillside Cemetery in Ormond Beach, Volusia County, Florida. 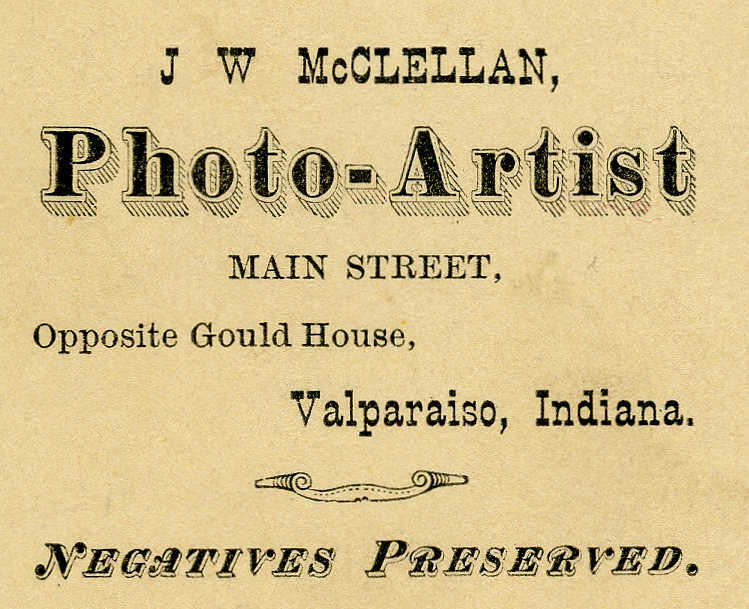 George Albert Webster operated a photography studio at 17 East Main Street [Lincolnway] in Valparaiso. Webster's business is listed in the city directory for Valparaiso in 1902. The 1900 federal census records for Center Township, Porter County, Indiana, enumerate George as a 43 year old whose occupation is listed as "Photographer." George's photographs were typically imprinted with G. A. Webster. By 1910, George A. Webster had moved to Bloomfield, Greene County, Indiana. George Albert Webster was born in Durham Township, Port Hope, Ontario, Canada, on May 24, 1857, the son of John Webster and Martha (Long) Webster. He migrated to the United States in 1866. He married Nellie F. Carpenter on December 8, 1887, in Winnebago County, Illinois. George died on February 12, 1924, in Chicago, Cook County, Illinois. 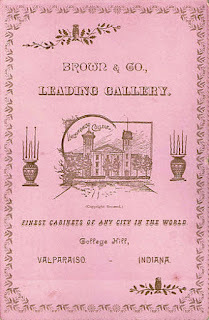 Directory listing G. A. Webster's Studio in Valparaiso. John Wells was the proprietor of a photography studio in Valparaiso during the early 1900s. His business was completely destroyed by a fire in May 1902, resulting in a financial loss of $2,500. It is unknown whether Wells reestablished his business. Floyd M. Whipple owned the Whipple Studio at 17 East Main Street [Lincolnway] in Valparaiso, possibly in partnership with his father Galon Whipple. It is also believed that Floyd managed the Star Studio on Valparaiso's College Hill for either his father, Joseph Harkless, or Henry A. W. Brown before opening his own studio at 12 East Main Street [Lincolnway] in Valparaiso. Whipple's work was imprinted with Whipple, Whipple Studio, F. M. Whipple, Photo Art Studio, The Star Studio. The 1880 federal census for Valparaiso indicates that Whipple's occupation was "Piano Tuner" and that he was living with his parents, Galon and Juliette Whipple. It is believed that Floyd and his wife, Effie, moved to Chicago around 1893 where Floyd would open F. M. Whipple & Company, a photography studio located at 738 South Halsted Street. The 1900 federal census for Laketown, Cook County, Illinois, shows that Floyd's occupation was "Merchant." By early 1908, Floyd was working as a real estate agent in Englewood neighborhood of Chicago. He then made his way to St. Louis, St. Louis County, Missouri, where he was the business manager of the Central Dryplate Company. In November of 1916, Floyd M. Whipple was employed as the general manager of the Bay State Film Company in Boston, Suffolk County, Massachusetts; this newly established company was a manufacturer of raw film for the emerging motion picture industry. The Bay State Film Company is believed to have failed by 1920. Research has failed to locate Floyd after 1920. Floyd M. Whipple was born in November 1857 in Illinois. He married Effie F. Louderback on May 15, 1882, in Porter County, Indiana. Galon Whipple was the father of Valparaiso photographer Floyd M. Whipple. The 1880 federal census for Valparaiso indicates that Galon's occupation was that of a photographer. By 1890, Galon had moved to Illinois and was operating a photography studio at 738 Halsted Avenue. Some of Galon Whipple's photographers were imprinted with Blue Light Gallery and G. Whipple. Galon Whipple was born January 9, 1823, in New York, the son of Ichabod Whipple and Chloe (Kempton) Whipple. He married Juliette Hewes on August 26, 1850, at Keene, Cheshire County, New Hampshire. Whipple died on August 17, 1895, in Chicago; his remains were interred in Maplewood Cemetery in Valparaiso. William H. White was a photographer located in the community of Wheeler, residing on North Second Street. The 1910 federal census for Union Township lists William as being a 26 year old married male with his occupation listed as photographer. White would imprint his photographs with PHOTO BY WHITE. Newspaper evidence suggests that White may have been employed around 1906 by the Reading Studio in Valparaiso. William Henry White was born November 10, 1883, at Hammond, Lake County, Indiana, the son of John A. White and Mariette (Bachelder) White. He married Asenath E. Obitts on November 25, 1905, at Hammond, Lake County, Indiana. Edmond Edway Wonser worked in partnership with an individual with the surname Lytle. Their business was located at 20 Locust Street in Valparaiso. Several individuals with the surname Lytle resided in Porter County at the time the studio is believed to have been in business and research concerning Lytle has yet to lead to a positive identification. Photographs produced by this partnership were imprinted with Wonser & Lytle. Genealogical and business directory evidence suggests that Wonser was active in the photography business in Valparaiso at some point between 1895 and 1900. The 1893 Valparaiso City Directory lists Wonser as a laborer residing at the Sefton Building. Edmond Edway Wonser was born August 21, 1860, at Oberlin, Lorain County, Ohio, the son of Elanson E. Wonser and Agnes Louisa (Brannon) Wonser. 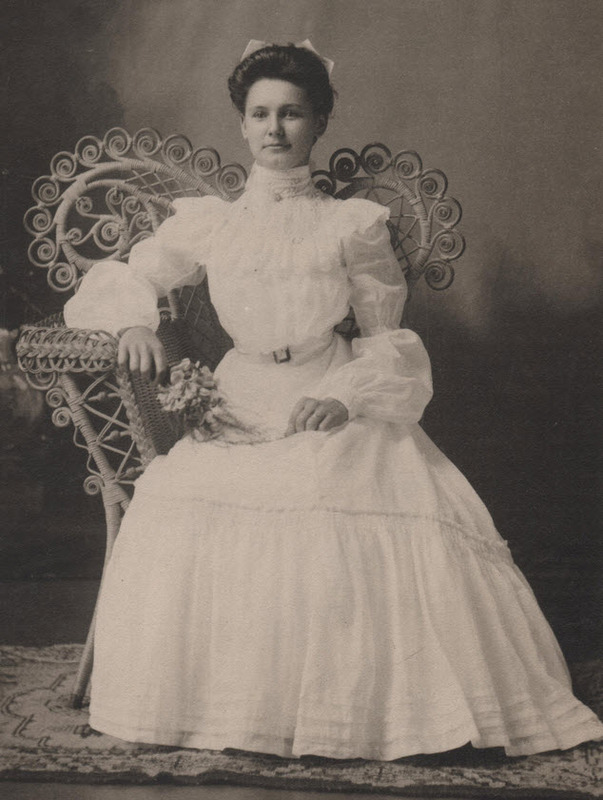 Edmond married Laverna Alda (Courtright) Wonser on February 2, 1882, at Coffey County, Kansas. Wonser was tragically killed in an automobile accident on February 19, 1927, at North Second and Oliver Street in Rockford, Winnebago County, Illinois; his remains were interred in Rockford's Greenwood Cemetery. An article concerning the automobile accident states that Wonser was operating a small grocery in nearby Loves Park in Winnebago County at the time of his death. Anonymous. 1958. Chicago Photographers, 1847 through 1900, as Listed in Chicago City Directories. Chicago, Illinois: Chicago Historical Society. Bumstead & Company. 1902. Valparaiso City and Porter County Business Directory. Chicago, Illinois: Radtke Brothers. 350 p.
Bumstead & Company. 1911. Valparaiso City and Porter County Business Directory. Valparaiso, Indiana: Crisman Brothers. 416 p.
Chicago Historical Society. 1958. Chicago Photographers, 1847 Through 1900: As Listed in Chicago City Directories. Chicago, Illinois: Chicago Historical Society. 82 p.
Goodspeed, Weston A., and Charles Blanchard. 1882. Counties of Porter and Lake, Indiana: Historical and Biographical, Illustrated. Chicago, Illinois: F. A. Battey & Company. 771 p. [see pp. 258-259, 260-261]. The Lewis Publishing Company. 1912. History of Porter County, Indiana: A Narrative Account of its Historical Progress, its People and its Principal Interests. Chicago, Illinois: The Lewis Publishing Company. 881 p. [see pp. 343-344, 736-737, 811-812]. Northwestern Indiana Telephone Company. 1923. Telephone Directory. 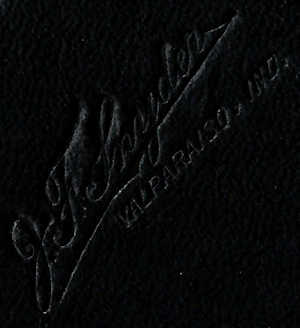 Valparaiso, Indiana: Joseph Decker. 152 p.
Talcott & Tevis. 1885. Valparaiso City Directory of the Inhabitants, Institutions, Manufacturing Enterprises and Business Houses of Valparaiso, Indiana, for the Year 1885-6. 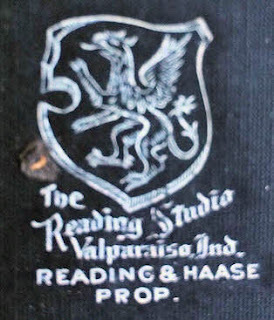 Valparaiso, Indiana: Vidette Publishing House. 125 p.
Anonymous. 1902. Items of Interest. The St. Louis and Canadian Photographer 26(6):268. Anonymous. 1916. With the Trade. Photo-Era: The American Journal of Photography 37(5):252. Anonymous. 1917. What's Doing in Photograph. Bulletin of Photography 20(511):498. Grand Trunk Railway. 1898. Valparaiso, Ind. Headlight: Sights and Scenes Along the Grand Trunk Railway 3(6):1-32. Wilson, Edward L. 1894. Editor's Table. Wilson's Photographic Magazine 31(449):237. Wilson, Edward L. 1897. Editor's Table. Wilson's Photographic Magazine 34(482):96. Marshall County Republican, Plymouth, Marshall County, Indiana; February 8, 1877; Volume 21, Number 8, Page 2, Column 7. 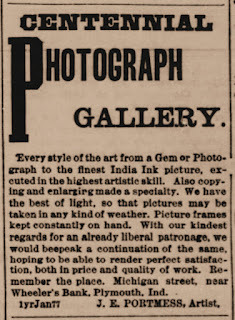 Advertisement for Centennial Photograph Gallery. The Parsons Daily Sun, Parsons, Labette County, Kansas; February 20, 1886; Volume 8, Number 29, Page 4, Column 1. Column titled "Local Brevities." The Bremen Enquirer, Bremen, Marshall County, Indiana; March 6, 1886; Volume 1, Number 16, Page 1, Column 6. Column titled "Local Links." The Bremen Enquirer, Bremen, Marshall County, Indiana; September 22, 1888; Volume 3, Number 45, Page 1, Column 7. Column titled "Local Links." Chesterton Tribune, Chesterton, Porter County, Indiana; May 31, 1895; Volume 12, Number 8, Page 1, Column 3. Column titled "Chesterton Chips." The Council Grove Republican, Council Grove, Morris County, Kansas; January 31, 1896; Volume 24, Number 5, Page 5, Column 2. Column titled "Local News." The Bremen Enquirer, Bremen, Marshall County, Indiana; December 3, 1897; Volume 12, Number 49, Page 1, Column 6. Column titled "Made Bogus Money. Two Counterfeiters, of Valparaiso, Given Five Years Each." The Los Angeles Times, Los Angeles, Los Angeles County, California; October 26, 1899; Volume 18, Page 13, Column 1. Column titled "Pasadena Brevities." The Chesterton Tribune, Chesterton, Porter County, Indiana; January 6, 1900; Volume 16, Number 39, Page 5, Column 5. The Chesterton Tribune, Chesterton, Porter County, Indiana; April 26, 1901; Volume 18, Number 3, Page 5, Column 6. Column titled "Porter Pointers." The Chesterton Tribune, Chesterton, Porter County, Indiana; May 24, 1901; Volume 18, Number 7, Page 4, Column 1. Column titled "Porter Pointers." The Chesterton Tribune, Chesterton, Porter County, Indiana; August 30, 1901; Volume 18, Number 21, Page 5, Column 6. Column titled "Thelma." The Chesterton Tribune, Chesterton, Porter County, Indiana; March 7, 1902; Volume 18, Number 48, Page 5, Column 7. Column titled "Porter Pointers." The Indianapolis News, Indianapolis, Marion County, Indiana; May 9, 1902; Volume 33, Number 132, Page 2, Column 6. Column titled "General State News." The Chesterton Tribune, Chesterton, Porter County, Indiana; October 24, 1902; Volume 19, Number 29, Page 4, Column 5. Column titled "Personals." The Chesterton Tribune, Chesterton, Porter County, Indiana; June 19, 1903; Volume 20, Number 11, Page 4, Column 5. Column titled "Porter Pointers." The Chesterton Tribune, Chesterton, Porter County, Indiana; August 14, 1903; Volume 20, Number 19, Page 5, Column 6. Column titled "Chesterton Chips." The Chesterton Tribune, Chesterton, Porter County, Indiana; May 27, 1904; Volume 21, Number 8, Page 4, Column 3. Column titled "Chesterton Items." The Chicago Daily Tribune, Chicago, Cook County, Illinois; November 4, 1905; Volume 44, Number 264, Page 3, Column 7. Column titled "Immoral Picture Factory is Raided by the Police." Alton Evening Telegraph, Alton, Madison County, Illinois; November 6, 1905; Volume 70, Page 3, Column 2. Column titled "Debasing Art is Seized. Plant for Producing Immoral Pictures Suppressed." The Chesterton Tribune, Chesterton, Porter County, Indiana; February 15, 1906; Volume 22, Number 46, Page 8, Column 5. Column titled "Kouts." The Chesterton Tribune, Chesterton, Porter County, Indiana; June 14, 1906; Volume 23, Number 11, Page 5, Column 4. Column titled "Local News of the Week." The Lake County Times, Hammond, Lake County, Indiana; January 5, 1907; Volume 1, Number 170, Page 1, Column 7. Column titled "Photo Making Genius Dies. 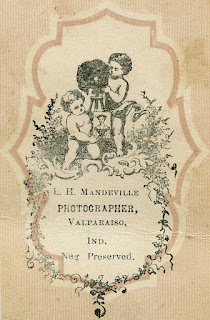 Lewis H. Mandeville of Valparaiso, One of the Pioneer Photographers." Englewood Times, Englewood, Cook County, Illinois; June 7, 1907; Volume 19, Number 34, Page 4, Column 2. Column titled "Deaths." The Lake County Times, Hammond, Lake County, Indiana; December 5, 1910; Volume 5, Number 144, Page 6, Column 6. column titled "Hobart." The Chesterton Tribune, Chesterton, Porter County, Indiana; April 3, 1913; Volume 30, Number 2, Page 3, Column 5. Column titled "Photos of Particular People to Lease." Hobart News, Hobart, Lake County, Indiana; October 30, 1913; Column titled "August Haase Studio Sold to J. J. Naumann." The Lake County Times, Hammond, Lake County, Indiana; November 15, 1930; Volume 3, Number 42, Page 6, Column 3. Column titled "Hobart." The Chesterton Tribune, Chesterton, Porter County, Indiana; September 10, 1914, Volume 31, Number 25, Page 7, Column 5. Column titled "The Shook Studio." The Chesterton Tribune, Chesterton, Porter County, Indiana; May 6, 1915, Volume 32, Number 7, Page 3, Column 4. Column titled "The Shook Studio." The Chicago Sunday Tribune, Chicago, Cook County, Illinois; March 26, 1916; Volume 75, Number 13, Section 10 - Want Ads, Page 7, Column 6. Column titled "To Rent -- Housekeeping Room, North Side." The Torch, Valparaiso, Porter County, Indiana; July 7, 1916; Volume 3, Number 35, Page 1, Column 3. Column titled "Attention Students." The Porter County Vidette, Valparaiso, Porter County, Indiana; August 1, 1917; Page 2, Column 5. Column titled "Father of Dr. Hayward Dies in Chicago." The Lake County Times, Hammond, Lake County, Indiana; November 10, 1917; Volume 6, Number 44, Page 5, Column 6. Column titled "In An' Around Gary." The Rockford Daily Register-Gazette, Rockford, Winnebago County, Illinois; November 26, 1917; Page 8, Column 1. Column titled "Tronce to Enter Army." The Lake County Times, Hammond, Lake County, Indiana; December 4, 1917; Volume 7, Number 140, Page 11, Column 5. Column titled "Day News in Gary." The Porter County Vidette, Valparaiso, Porter County, Indiana; December 12, 1917; Page 2, Column 1. Column titled "Local Squibs and Personals." The Porter County Vidette, Valparaiso, Porter County, Indiana; December 12, 1917; Page 4, Column 2. Column titled "'Moving Pictures' Discussed at Club Meeting." The Chesterton Tribune, Chesterton, Porter County, Indiana; April 18, 1918; Volume 35, Number 5, Page 3, Column 1. Column titled "Porter Department. Swedish Lutheran Church." The Indianapolis News, Indianapolis, Marion County, Indiana; August 20, 1921; Volume 52, Number 231, Page 18, Column 4. Column titled "Indiana News in Brief. Valparaiso." Decatur Herald, Decatur, Macon County, Illinois; November 20, 1921; Volume 41, Page 3, Column 3. Column titled "Two Angels Visit Decatur Home, Bear Father and Son. Ernest Atkins Dies 12 Short Hours Before Birth Of Edward Francis." The Richmond Item, Richmond, Wayne County, Indiana; June 29, 1922; Volume 44, Number 310, Page 3, Column 2. Column titled "Fayette County News." Altoona Tribune, Altoona, Blair County, Pennsylvania; June 25, 1923; Number 14364, Page 20, Column . Column titled "Deaths. Rudolph H. Keagy." Sullivan's Englewood Times, Englewood, Cook County, Illinois; August 10, 1923; Volume 36, Number 52, Page 8, Column 4. Column titled "Charles A. Mayo." The Chesterton Tribune, Chesterton, Porter County, Indiana; March 17, 1927, Volume 44, Number 1, Page 5, Column 2. Column titled "Mrs. Clara Hoyt Williams." St. Joseph Herald-Press, St. Joseph, Berrien County, Michigan; June 13, 1927; Page 8, Column 2. "Column titled "Treasurer of Watervliet Is Taken By Death. Frank D. Hunt Succumbs at Kalamazoo Following Operation." The News-Palladium, Benton Harbor, Berrien County, Michigan; June 14, 1927; Volume 42, Number 37, Page 8, Column 4. Column titled "Hold Rites For Official Of Watervliet. Masons Pay Tribute Today At Funeral Of Treasurer Frank D. Hunt." The Vidette-Messenger, Valparaiso, Porter County, Indiana; June 20, 1929; Volume 2, Page 1, Column 1. Column titled "Death Claims Joe Decker at Local Hotel." The Vidette-Messenger, Valparaiso, Porter County, Indiana; September 4, 1929; Volume 3, Page 3, Column 7. Column titled "Partner Asks Receiver Firm." The Vidette-Messenger, Valparaiso, Porter County, Indiana; November 7, 1929; Volume 3, Page 11, Column 2. Column titled "Help Valparaiso University Find Present Addresses of Former Students." The Vidette-Messenger, Valparaiso, Porter County, Indiana; January 31, 1931; Volume 4, Page 1, Column 6 and Page 4, Column 7. Column titled "C. F. Jones, 85, Dies After a Short Illness." Oakland Tribune, Oakland, Alameda County, California; May 28, 1932; Volume 116, Number 149, Page 2, Column 3-5. Column titled "Five Couples in Reunion to Honor Golden Weddings." Omaha World-Herald, Omaha, Douglas County, Nebraska; September 12, 1933; Volume 49, Number 11, Page 15, Column 2. Column titled "News in the Social World. Frank Beam." 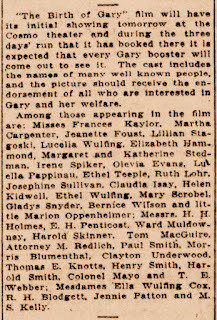 The Kansas City Star, Kansas City, Jackson County, Missouri; November 19, 1933; Volume 54, Number 63, Page 5B, Column 6 Column titled "Other Deaths in Greater Kansas City." The Vidette-Messenger, Valparaiso, Porter County, Indiana; November 20, 1933; Vole 7, Page 1, Column 6. Column titled "Receives Word Death Brother." The Vidette-Messenger, Valparaiso, Porter County, Indiana; August 12, 1936; Volume 10, Page 2, Column 6. Column titled "W. H. Gerhart 90, to Attend Centennial." The Vidette-Messenger, Valparaiso, Porter County, Indiana; March 31, 1937; Volume 10, Page 2, Column 3. Column titled "Death Claims John Garrison at Hospital." The Vidette-Messenger, Valparaiso, Porter County, Indiana; September 28, 1938; Volume 12, Page 2, Column 8. Column titled "Former Local Resident Dies." The Vidette-Messenger, Valparaiso, Porter County, Indiana; October 3, 1938; Volume 12, Page 2, Column 4. Column titled "John Hisgen, Photographer, Dies Aged 65." The Vidette-Messenger, Valparaiso, Porter County, Indiana; October 24, 1938; Volume 12, Page 1, Column 3 and Page 2 Column 3. Column titled "Harry Clark Pilots Final Railway Run." The Hammond Times, Hammond, Lake County, Indiana; October 24, 1943; Volume 38, Number 109, Page 6, Column 1. Column titled "Pioneer Physician Dies." The Jewish Post, Indianapolis, Marion County County, Indiana; April 25, 1944; Volume 11, Number 45, Page 8, Column 3. Lafayette Journal and Courier, Lafayette, Tippecanoe County, Indiana; April 25, 1944; Volume 99, Number 25, Page 11, Column 5. Column titled "Charles B. Hinea Is Taken by Death." The Vidette-Messenger, Valparaiso, Porter County, Indiana; November 23, 1945; Volume 19, Page 1, Column 6. Column titled "Cassius E. Barrett." The Vidette-Messenger, Valparaiso, Porter County, Indiana; November 26, 1945; Volume 19, Page 2, Column 3. Column titled "Barrett Rites Held Saturday." The Vidette-Messenger, Valparaiso, Porter County, Indiana; January 20, 1947; Volume 20, Number 167, Page 1, Column 1. Column titled "Long Illness Is Fatal To Louis Szold. Former Merchant Of City Taken By Death Here Sunday Morning. " The Vidette-Messenger, Valparaiso, Porter County, Indiana; September 17, 1948; Volume 22, Number 63, Page 4, Column 4. Column titled "Looking Backward. Fifteen Years Ago." The Vidette-Messenger, Valparaiso, Porter County, Indiana; February 3, 1949; Volume 22, Number 179, Page 1, Column 3. Column titled "Heart Attack Proves Fatal. Bernhardt Schuldt Dies In Hospital Here On Wednesday." The Detroit Free Press, Detroit, Wayne County, Michigan; February 5, 1949; Volume 118, Number 277, Page 19, Column 3. Column titled "Michigan Deaths." The Vidette-Messenger, Valparaiso, Porter County, Indiana; November 25, 1950; Volume 24, Number 122, Page 1, Column 2. Column titled "Death Takes M. M. Mudge: Former Valparaiso Photographer Dies In Daytona, Florida." Chicago Daily Tribune, Chicago, Cook County, Illinois; February 28, 1951; Volume 110, Number 51, Page 18, Column 6. Column titled "Death Notices. Hoffman." The Vidette-Messenger, Valparaiso, Porter County, Indiana; April 11, 1951; Volume 24, Number 237, Page 1, Column 8. Column titled "Death Takes Leo Lilienthal." The Vidette-Messenger, Valparaiso, Porter County, Indiana; July 10, 1959; Volume 33, Number 5, Page 1, Column 4. Column titled "Art Nickel, 76, Druggist, Dies In PMH." The Vidette-Messenger, Valparaiso, Porter County, Indiana; November 11, 1961; Volume 35, Number 111, Page 1, Column 5 and Page 3, Column 2. Column titled "Chesterton Businessman Dies At 84. Final Rites For Harry R. Smith Will Be Monday." The Vidette-Messenger, Valparaiso, Porter County, Indiana; May 18, 1963; Volume 36, Number 269, Page 1, Column 3. Column titled "Veteran 'Hill' Photographer Dies Aged 81." The Vidette-Messenger, Valparaiso, Porter County, Indiana; June 22, 1964; Volume 37, Number 298, Page 1, Column 2 and Page 6, Column 2. Column titled "President Of Apron Firm Dies." Orlando Sentinel, Orlando, Orange County, Florida; September 9, 1964; Volume 80, Number 119, Page 9-B, Column 5. Column titled "Obituaries." Osceola-Polk Sentinel, Winter Haven, Polk County, Florida; September 10, 1964; Page 2, Column 2. Column titled "Obituaries." Fort Myers News-Press, Fort Myers, Lee County, Florida; July 27, 1966; Volume 82, Page 2, Column 7. Column titled "D. R. Chapek." Chicago Tribune, Chicago, Cook County, Illinois; February 28, 1968; Volume 121, Number 59, Section 1A, Page 10, Column 7. Column titled "Death Notices." Chicago Tribune, Chicago, Cook County, Illinois; January 2, 1994; Column titled "History by Mail: Photo Postcards are Snapshots of Time Gone By," by Abigail Foerstner. South Bend Tribune, South Bend, St. Joseph County, Indiana; November 14, 2016; Column titled "A Look Back: Ault Camera Shop in South Bend Captured Memories." Wow, what an extensive list! This is a great resource. Thanks for posting. Thank you very much for this well-researched article. Great information! I'm going to link to this from my blog. Thanks for the kind remark. I know that you have been researching photographers of the Region, too. Please let me know if you run into any additional information about the individuals I've listed here, or if you discover individuals not listed. I'm absolutely certain there are several folks I have not included in the list. It's seems probable that Ault is probably the Ault Camera Shop in South Bend. My neighbor worked there when I was a kid. Thanks for this information and the link to the South Bend Tribune article. I will update this list accordingly. Regarding C.R. Childs. I have him being born in Elwood IL rather than Chicago. Do you have a source for the Chicago birth? Excellent resource!! i have several very old photos from the Porter County and surounding area, some are included above some are not.... i have all the photos scanned would be happy to send the info, it's nice to be able to date some of these based on when the studios we're in business. I love conducting research and it is clear you do too. I am searching for images of the Lincoln Highway in Indiana. I've seen a few by Brooks and Chapek and wondered if there was a location for their archives? Thank you. I'm unaware of the existence of an archive of Brooks and Chapek photographs. However, if you're trying to find images of the Lincoln Highway in Indiana, you might want to try contacting the Lincoln Highway Association (https://www.lincolnhighwayassoc.org/).